BRONZclay, the first commercially available bronze clay, was developed by retired chemist Bill Struve, PhD through his company, Metal Adventures, Inc. and launched in 2008. It was the first base metal clay on the market and also the first to require kiln firing in activated carbon. The carbon firing method that Bill Struve came up with was the first step toward making base metal and silver alloy clays, including sterling silver clay, commercially viable. Today bronze, copper, steel, and other base metal clay formulas are extremely popular because they provide an affordable alternative to costly gold and silver metal clay, as well as a wider variety of metal colors. Although this article is specifically about the Original BRONZclay formula, much of this information also applies to other bronze clay and base metal formulas. The material is a mixture of microscopic metal particles (11% tin and 89% copper) held together with an organic binder and water. Most of the water evaporates as the clay dries. The binder and remaining water burn away or evaporate during firing, and what remains is pure bronze metal. In July 2010 Metal Adventures subsequently introduced a FASTfire BRONZclay formula, however this article focuses on the original formula. Since then, many new bronze clay formulas have been introduced, including several varieties and formulas of Hadar's Clay bronze metal clay as well as others from Prometheus, Metal Mania Metal Clay, Goldie Bronze, Noble Clays, Zab's and Aussie Metal Clay. Some of them are sold as powder, others as lump clay. Those brands and formulas will be address in a different article. The formulas and characteristics of the competing bronze clay products differ somewhat, but they share more similarities than differences. Choosing between them is a matter of personal experience and individual preference. Several years before BRONZclay was launched, Bill Struve was inspired by his wife, LaceyAnn, to work on developing bronze and copper clay formulas that would provide metal clay artists like her with less costly alternatives to fine silver clay and 22k gold clay, the only options available at the time. He started Metal Adventures, a new company focused on this pursuit. Dr. Struve invited several leading metal clay artists to experiment with and provide input into early versions of his bronze clay formula. The initial testers were very excited about the possibilities of this new material and offered valuable feedback and suggestions. After a few rounds of refinements based on the alpha and beta testers' input, Dr. Struve's much-anticipated bronze clay was "ready for prime time." While the formula was being evaluated and refined, Dr. Struve collaborated with Rio Grande product manager Kevin Whitmore, who became responsible for packaging, distributing, branding and marketing Metal Adventures' first consumer product. The product launch at the July, 2008 PMC Conference in Indiana was extremely successful. At the time, Rio Grande was the sole authorized supplier, and as a result of the overwhelming demand the initial supply sold out completely in just a few days. After the conference, Whitmore expanded Rio Grande's production capability and set up a worldwide sales network. 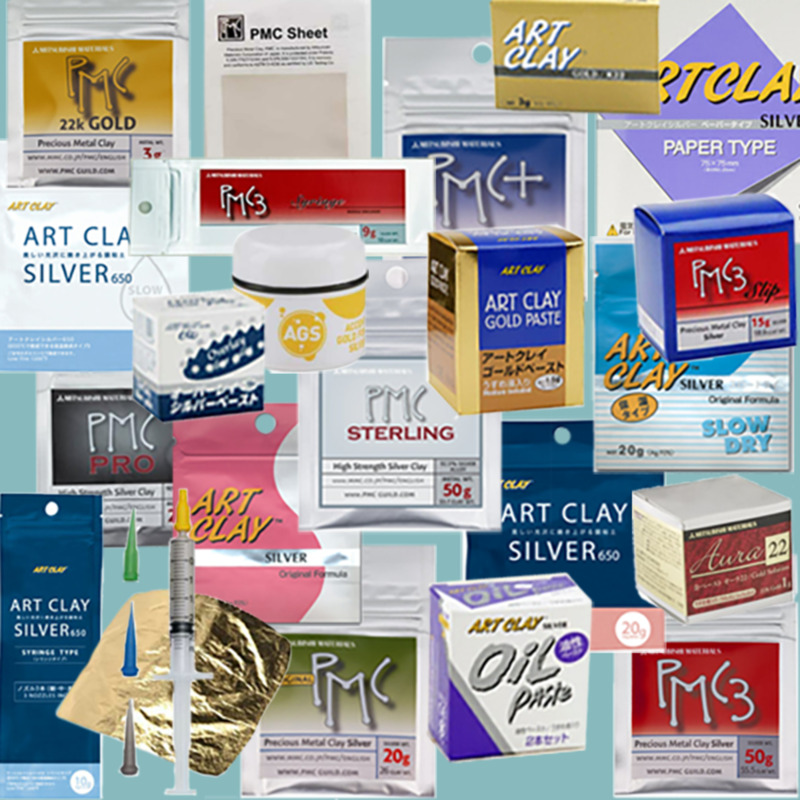 As a result, the clay became available to artists from metal clay suppliers around the globe. Rio Grande and its distributors subsequently introduced Metal Adventures' COPPRclay copper metal clay in the spring of 2009. Hadar Jacobson also had begun formulating bronze and copper metal clay for her personal use as far back as 2004. However, she did not get consistent firing results until Bill Struve developed the activated carbon firing method. Once she experimented with firing her own base metal clay formulas in activated carbon she was able to develop consistently successful firing schedules for them in both front-loading and top-loading kilns. She began selling her own bronze and copper clay powders to the public shortly after BRONZclay was launched, and subsequently branded them Hadar's Clay. You can learn more about the history behind the development of Hadar's Clay on her blog. So Many Bronze Clay Choices... So Little Time! Which of the following bronze clay formulas that you have tried is your favorite so far? Please leave your impressions in the comments section. Thanks! Since I created the poll even more brands and formulas of bronze clay have become available, including new formulas and colors from Hadar Jacobson, Zab's Bronzes in Luna, Sol and Rojo Bronze colors and Aussie Metal Clay in Gold and Ruby Bronze colors. Unfortunately, I cannot add them to this poll without losing all the previous responses. Artist and instructor Patrik Kusek shares his techniques for striking nature themed metal clay jewelry in Woodland Chic: Metal Clay Jewelry As Nature Intended. Inside the book is a password to access to related videos and supplementary materials on Patrik's Woodland Chic companion site. There are many projects in bronze, copper and silver clay, including several that combine different clay types. The first edition of Sherri Haab's "The Art of Metal Clay" was one of the first important books about metal clay techniques and projects. It has remained so popular that it has been expanded and revised multiple times. The most recent revision (2010) of The Art of Metal Clay includes a lot of new information including a lot of great material on working with bronze and copper clay as well as a helpful companion DVD. Highly recommended. Gordon Uyehara's wonderfully inspiring and educational book is out of print, but it's worth looking for a remaindered or second hand copy. Gordon shares his creative philosophy and metal clay techniques, including a lot of extremely useful information about working with bronze and copper clay, separately and in combination. Must be fired in activated carbon. Bronze clay reacts with oxygen in the air to create oxides that interfere with the sintering process. 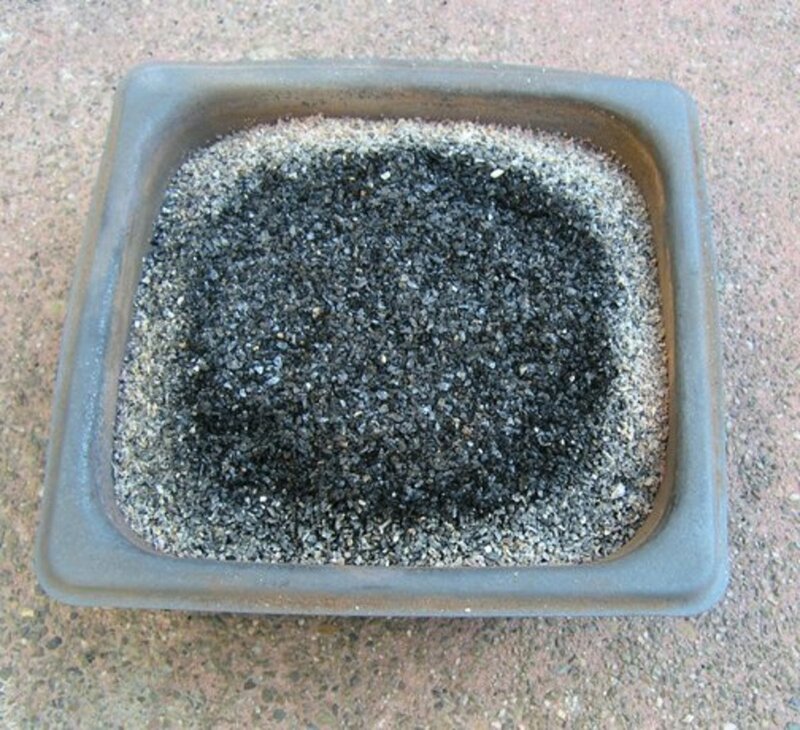 To minimize the clay's exposure to oxygen during firing, the unfired clay is buried in activated carbon granules during the firing process. It cannot be fired in an open air firing (AKA atmospheric firing), which means it also cannot be fired with a torch or in a hot pot, SpeedFire cone, or UltraLite kiln or other trinket kiln. Requires significantly different firing set-ups and longer firing schedules than silver clay or subsequent bronze clay formulas designed for quicker firing. Has a much narrower range of firing schedules and conditions in which full sintering can occur. The amount of oxygen present during firing, the type of activated carbon and firing container used, the placement of the metal clay pieces within the activated carbon filled container and the volume of metal clay to carbon are just some of the factors that can affect sintering of base metal clay formulas. Will not sinter in the presence of unfired silver clay. Cannot be embellished with pure gold or fine silver via diffusion bonding (e.g., keum-boo). However, silver accents can be applied using Accent Silver, a silver alloy applied like slip and fired in activated carbon. Reacts with liver of sulfur (LOS) by producing only dark patinas ranging from brown to nearly black. However, iridescent colored patinas can be achieved with the application of heat and sometimes appear in pieces fresh from the kiln. Costs much less than silver clay, freeing you to make larger pieces and experiment without worrying about wasting costly silver clay as you try out new ideas. 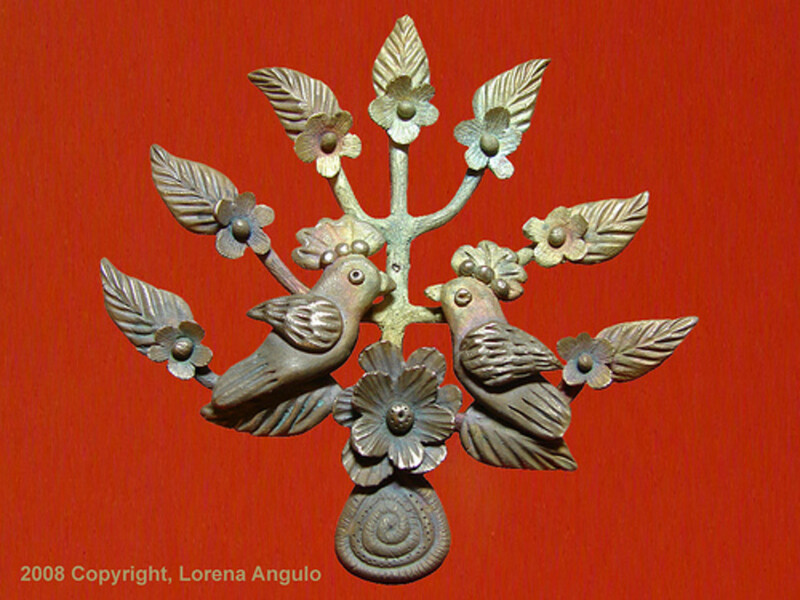 Bronze clay also widens the appeal and accessibility of metal clay for artists who specialize in other media. 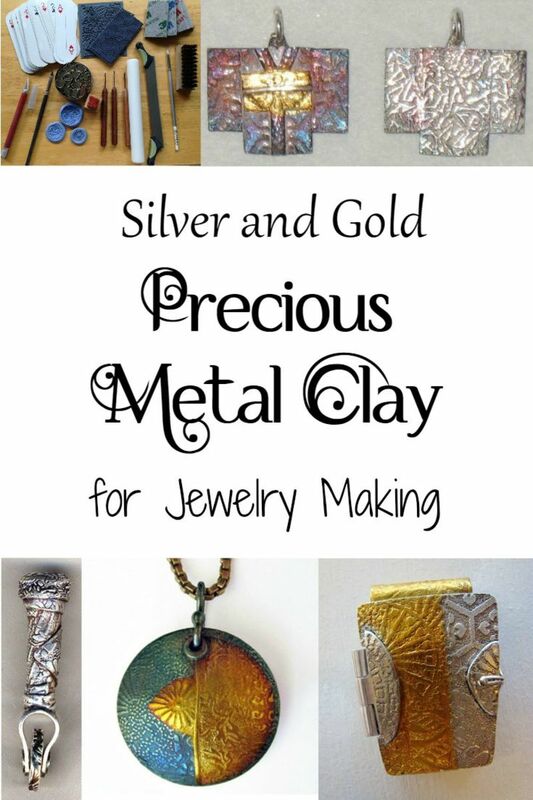 Ronna Sarvas Weltman, author of "Ancient Modern: Polymer Clay And Wire Jewelry", took a PMC class a few years ago but found the cost of precious metal clay limiting. "My artistic voice is very primitive, and bronze clay makes it easier to articulate my aesthetic vision while keeping my materials costs reasonable." Is extremely hard when sintered fully. Bronze metal is extremely dense/hard/strong, and fired BRONZclay is 90% of the density of bronze (only 10% porosity). This means your finished pieces will be far more durable than their fine silver counterparts, and that you can use the clay to make not only toggle clasps but also hook clasps that will stand up to wear and tear, as well as extremely sturdy hinges. It is a good idea to anneal fired bronze clay pieces before bending or shaping them with tools. Takes texture beautifully and is easy to carve or file. Remains leather hard and much more flexible than silver clay when dry, so it can be used to create clay jump rings and dimensional links that can be flexed open to accommodate another component and then closed permanently. Has a wonderful natural warmth after firing; wire brushing and additional finishing are optional. You can keep the soft, matte finish straight from the kiln or burnish part or all of the metal for a bright golden shine. Colorful patinas sometimes develop during the carbon firing. Can be colored vibrantly after firing with heat or chemical patinas or applied coloring materials such as Gilders Paste or Prismacolor pencils, if desired. 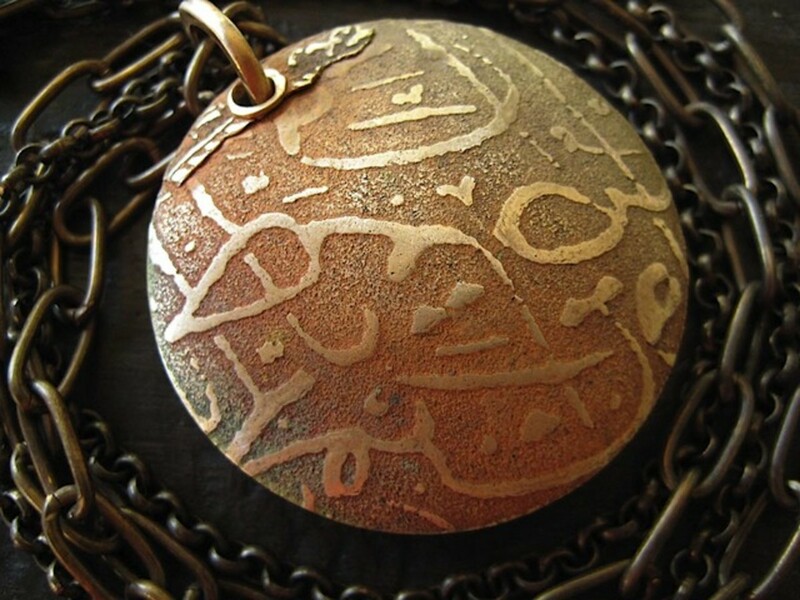 Despite its challenges and idiosyncrasies, more and more metal clay artists are working with bronze clay because of its affordable cost and advantageous qualities. The consistency of BRONZclay straight from the factory package can vary, depending on a variety of factors including how long ago it was packaged, the weather/temperature during shipping, etc. Before using this formula straight from the package, you'll need to condition it with generous amounts of olive oil to redistribute the moisture evenly throughout the clay, remove any stickiness, and improve the consistency of the clay. "Wedging" the clay briefly will press out any of the tiny bubbles that can form throughout the clay when it is mixed during production. The entire conditioning/wedging process should take about 40-60 seconds. Different artists and teachers have their own preferred methods for conditioning fresh BRONZclay. Following is the method I learned from Celie Fago, which I have found to make an enormous difference in the clay's workability. It also solves the problem of stickiness, which frustrates many metal clay artists who have tried this clay. Begin by coating your hands generously with olive oil. Remove a new bar of fresh clay straight from the package and press it into a rough patty. Repeat this rolling/pressing motion until all the clay from the edges has been moved into the center of the patty and the moisture in the clay has been distributed as evenly as possible. If the clay seems a bit crumbly or cracks when you press it into a patty or roll it out), knead in a little water alternately with the olive oil until the clay absorbs enough moisture to eliminate the problem. Continue to knead additional olive oil into the clay until it is smooth, pliable, and has lost its stickiness. You should feel a distinct difference in the consistency and workability of the clay after you have conditioned it using this method. Important: Kneading the clay without working in the oil will dry out the clay. The clay straight from the package can contain microscopic air bubbles. (Imagine air whipped into a batter or dough in an electric mixer.) Wedging the clay compacts it and presses out any air bubbles. Compact the clay by squeezing it together several times, alternating hands, then roll it firmly into a ball. Wedge the clay by placing it in the palm of your non-dominant hand. Cover the clay with the heel of your dominant hand and press it firmly into your palm, simultaneously pushing it down into your palm and pressing/smearing it towards the thumb of your non-dominant hand. Roll the clay firmly between your palms to create a smooth ball. Wrap it loosely in cling wrap or plastic wrap (with the top exposed), place it inside a storage environment with something to keep it humid (e.g., a piece of damp sponge) and set it aside to rest for at least 15-30 minutes, preferably overnight. Note: I moisten my sponges with distilled water mixed with a little white vinegar to help avoid mold formation. Make sure the moistened sponge does not touch the clay. You can condition, moisten (if necessary) and wedge all or only part of a new package of BRONZclay. I generally find it more convenient to condition an entire package (50 to 100 grams at a time) while I'm at it and then store all the conditioned clay in a hydrating environment, as described below, until I'm ready to use some of it. If I'm using a 200 gram package, I break or cut it into two to four equal portions and then condition them individually, either immediately or as needed. Gail Lannum of Moon River Beads usually prefers to condition only 50 grams at a time. Mardel Rein of Cool Tools conditions 100 grams at a time. To condition the entire contents of a 200 g package, she suggests breaking apart the large bar into two pieces and conditioning them one at a time. While BRONZclay dries out somewhat more slowly than silver clay, all metal clay begins to lose moisture as soon as it is exposed to air and should be kept in a humid environment to prevent it from drying out or cracking as you work with it. A clay humidifier is one convenient way to keep your working clay moist. Another option is to tuck the unused portion of your working clay into a small flexible storage pouch or empty plastic paint pot or paint cup during your work session. What I often do is to take a bit more clay than I think I'll need for the work session from the original pouch (or my long-term storage container) and condition it. Then I'll either roll it out to texture or cut my first component or pinch off the amount I need to sculpt my first component, and then roll the remainder of the conditioned clay into a smooth ball and tuck it into a small, empty plastic paint pot/cup and pop on the tight-fitting lid until I need more. If I'm making a larger project I may need to divide the clay into two or more balls to fit them into the small paint pots. It's important to use the smallest container that will hold the amount of clay you need to keep moist, so that very little air can fit into the container along with the clay. Also, whether you use a flexible storage pouch made specifically for storing metal clay or a small paint pot, write the name of the clay formula on whichever temporary storage pouch you use use it to store that formula only. I've provided specific product suggestions, sources, and instructions for making a homemade humidifier in my article on storing metal clay (see the link below in the "Storing the Clay" section). Sometimes I just tuck the unused clay back into the same hydrating/humidifying environment I use for long-term storage. Any metal clay (precious metal or base metal) will dry out faster in a dry climate or environment (e.g., heating or air conditioning). In dry environments, it is especially important to keep your unused clay in a hydrating environment during, as well as between, work sessions. In the winter I usually turn on a humidifier in my studio (or whatever room I'm working in). Between running the air conditioner during the summer and running the heat during the winter, my studio frequently becomes a dry environment. So when I'm working with bronze clay or any other metal clay it tends to dry out quickly during those times. I've found that using a small humidifier in my studio or other work area keeps the clay moist much longer during a work session. Celie Fago has found that storing metal clay in a hydrating environment or clay humidifier after exposure to air allows it to absorb exactly the amount of moisture it needs to achieve an ideal moisture content. She has found that placing freshly conditioned and wedged BRONZclay into a clay humidifier for at least 15-30 minutes and preferably overnight allows the clay to acquire close to the optimum amount of moisture for the perfect working consistency. By storing any type of metal clay this way during and between your work sessions it remains at the perfect moisture level until you are ready to use it. You can learn more about how to create a humidifying environment or clay humidifier in my article on Metal Clay Storage. Many artists find that chilling this clay improves its workability significantly. Dr. Struve, the clay's creator, told me he believes that this is a perception that came about as a result of a misinterpretation of a particular fact about the formula. According to Dr. Struve, the binder used in BRONZclay, when combined with water, does tend to get slightly stiffer when warmer and slightly softer when cooler. However, he points out that the binder is the same material that is used in ALL metal clays, both base metal and precious metal clay (some brands also add additional binder materials), and that temperature has virtually no effect on the workability of the clay. Just as no one worries about keeping their silver clay cool, he feels there is no need to do so with this formula. Many metal clay artists believe that chilling improves the clay's pliability significantly. Others have had very different experiences. For example, Celie Fago says that she and Jennifer Kahn tested the workability of cold vs. room temperature clay numerous times and found that temperature had no effect on the clay's workability once it had been conditioned properly with sufficient olive oil. Celie said, "I work in a tiny room with a roaring fire so my clay is never really cold. I think the best working consistency is achieved by conditioning the clay [with generous amounts of olive oil] and then keeping it hydrated, not cold." Before I tried out Celie's method for conditioning BRONZclay (explained in "How to Condition the Clay") I found that chilling the clay seemed to improve its pliability and remove some of the stickiness. After I started conditioning my clay with generous amounts of olive oil, however, clay that I had conditioned in this manner was just as pliable and no stickier at room temperature than it was when chilled. That's my own experience. Your mileage may vary. Regardless of the temperature at which you store your clay, I'd encourage you to try out her conditioning method for yourself and see whether you find it helpful, especially if you teach since refrigeration for materials and supplies isn't available in most classrooms. Bronze is an alloy of copper and tin. When copper is exposed to oxygen, two types of copper oxides can form depending on the conditions: cuprous oxide and cupric oxide. Since copper oxides interfere with bronze clay's sintering process, a lot of emphasis has been placed on minimizing the clay's exposure to air. However, experimentation has proven that the oxidation process is reversed completely when the clay is fired under activated carbon. To test his thesis, Bill Struve made up two batches of clay using the same method as for BRONZclay and COPPRclay, but substituting cupric oxide and cuprous oxide for the bronze or copper metal particles. Both clays made from copper oxides produced pure copper after being firing in activated carbon! This successful experiment was designed to prove that oxidation in unfired clay or slip is not a cause for concern. Any copper in the clay that oxidizes prior to firing under carbon will revert completely to copper during the carbon firing. BRONZclay can be rolled, shaped, textured, modeled, sculpted, molded, carved, extruded, etc. very similarly to other metal clay types, brands and formulas. BRONZclay is rolled out similarly to any other metal clay except that you need to oil the rolling surface and any texture sheets you use with a more generously coating of olive oil than you would use with most other metal clay formulas. Celie Fago taught me to roll out any type of metal clay inside an oiled plastic sheet protector to minimize the clay's exposure to air and keep it moist. Oil the insides of both pages of the sheet protector as well as the non-stick sheet on which you will roll out the clay. If you have conditioned your clay with sufficient olive oil to remove the stickiness (and/or if you are rolling the clay on an oiled piece of non-stick sheet inside an oiled page protector as recommended), you do not need to oil your clay roller. You can sculpt, model or mold the clay or cut it out with shape cutters or a blade. This clay formula is especially easy to carve as a result of a modification to the original formula that Bill Struve made at the request of Celie Fago, who loves its superior carving qualities. You can carve it with wood or linoleum micro carving tools, needle files, needle tools, diamond-coated rotary tool bits, a craft knife, scalpel,, etc. Like precious metal clay, it can be textured with texture plates, sheets or mats (e.g., plastic, rubber, silicone, brass, etc. 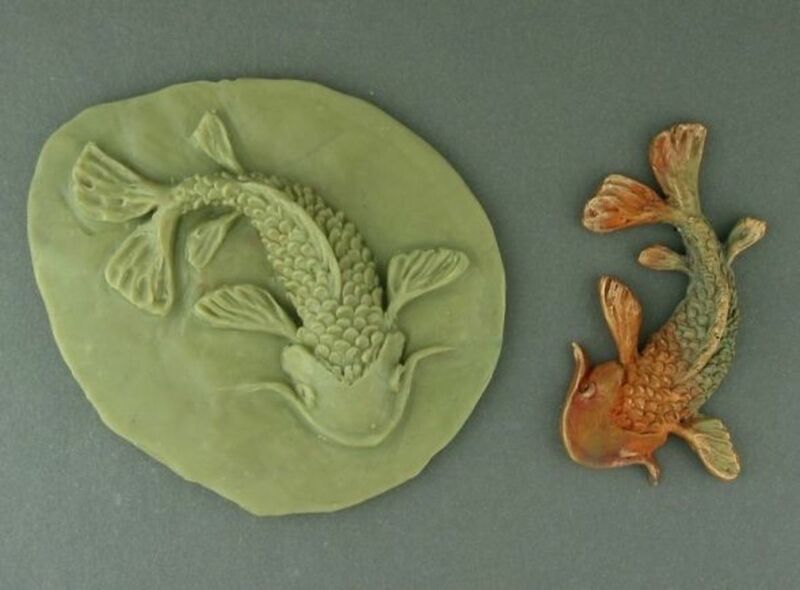 ), with rubber stamps, tear away texture papers, texture tiles made by baking the textured polymer clay that remains after making tear away texture papers, or other textures, or pressed into homemade or purchased molds. See my article on Metal Clay Textures for a wide range of texturing ideas and techniques. BRONZclay shrinks significantly more than medium- or low-fire precious metal clays or than many other bronze metal clay formulas, so textures and other surface details become even crisper/sharper after firing (similar to Original/Standard PMC). Softened and moisturized clay can be extruded through either a clay extruder or a clean, empty clay syringe without a tip. If your extruder has been used with another type of metal clay or polymer clay previously, don't use it with BRONZclay until you have scrupulously cleaned every part of the extruder, including rubber O-rings/gaskets, as well as the tips (and cores, if you plan to extrude tube shapes). Note: Some artists pull apart used silver clay syringes, clean them thoroughly, and cut off part of the tip to create a larger hole. Used silver clay syringes can be difficult to clean thoroughly; a new, empty syringe costs less than a dollar and ensures there is no cross-contamination of silver and bronze. Use freshly conditioned and wedged clay with a little extra water worked in to make it slightly moister and softer than usual. (As with silver clay, don't re-use scrap clay for extruding.) After moistening the clay and setting it aside (wrapped or in a hydrating environment) for 10-15 minutes so the moisture is absorbed evenly, compress the clay firmly between well-oiled palms into a thick snake or log. You want to make sure all the air has been forced out of the clay. Roll the snake under your palms on an oiled work surface and then even it out by using a snake roller. You want its diameter to fit snugly inside the extruder barrel or syringe. Cut a piece of the rod about 1/2 to 2/3 the length of the chamber and carefully slide it inside the extruder barrel or empty syringe. The oil that remains on the surface of the clay will make this easier. Do your best not to trap any air pockets as you press the clay into the cavity. (Making the rod nearly the same width as the interior of the cavity reduces the likelihood of creating air pockets as you load the clay.) When the entire rod of clay is inside the extruder barrel or syringe, (re)insert the plunger and slowly depress it until the clay reaches just to the tip. Dip a toothpick or the end of a paper clip into distilled water and push it through the opening in the tip (do not use a syringe tip attachment) to help release any trapped air. Extrude the clay onto an oiled surface. You may find it easier to extrude this dense clay if you use a syringe accessory to increase your leverage, such as Cool Tools' Syringe Comfort Handle or the Easy Squeeze from PMC123. Artist and teacher Janet Alexander has found that rolling a FASTfire BRONZclay snake in olive oil, spritzing it with distilled water mixed with a few drops of lavender oil, and then mixing in a few drops of Sherri Haab PasteMaker creates a soft, smooth mixture that extrudes beautifully. It may be worth trying the same thing with the original formula. Tonya Davidson wrote a terrific chapter on using silver syringe clay in the wonderful book, "PMC Technic: A Collection of Techniques for Precious Metal Clay". Although the chapter refers specifically to commercial silver-clay-filled syringes, many of these techniques also can apply to extruding moistened BRONZclay through a syringe. BRONZclay shrinks approximately 5% from fresh to leather hard. If the clay is submerged in activated carbon during the entire firing process, it shrinks another 15%-25% during firing. However, some of the current experiments indicate that when more of the binder is allowed to burn off during a preliminary open-air firing, the shrinkage rate becomes much more consistent (around 17% from leather-hard to fired). All metal clays shrink at significantly different rates depending on size, shape, and thickness when they are fired; this phenomenon is more noticeable in high-shrinkage clays like this one. Also, shrinkage in BRONZclay appears to be more variable than in silver clay. For example, holes do not shrink as much as outer dimensions, and some shapes seems to shrink more or less than others. The current thinking among some artists is that some of these variations in shrinkage may be caused primarily by incomplete sintering. This theory is difficult to test, however, because even pieces that have not sintered to their maximum density/shrinkage can be extremely strong, making it hard to tell whether or not a fired piece has sintered all the way through. In the bronze clay class I took with Celie, she suggested that we trace the outlines and note the thickness of our pieces at the fresh, dry and fired stages, and to keep notes on how much different sizes, shapes and thicknesses shrink for future reference. If you have access to a photocopier, using it to copy your leather-hard and fired pieces is faster, easier and more accurate. Jot notes on your tracings and/or photocopies and keep them in a file or notebook; they're useful in estimating the shrinkage of new designs or recreating the same or similar pieces at a future date. Measuring a piece's shrinkage from leather-hard to fired can be a good preliminary indicator of whether the material has sintered fully. While there is no hard-and-fast rule, look for 15-20% shrinkage in the area or dimension with the highest percentage of shrinkage. For example, for a closed ring shape (e.g., a ring, bangle or link), measure the shrinkage of the thickness, since the inner diameter (the hole) won't shrink much. For a flat piece, measure either the length or width. If the shrinkage seems high enough, move on to the tests in the Strength/Stress Testing Fired Pieces section. BRONZclay is not sold in slip or paste form. Paste or slip is prepared from lump clay and distilled water. It needs to be made thicker than silver clay slip or paste in order to make attachments effectively. Using a palette knife against a smooth work surface (such as a piece of glass or acrylic), work distilled water into a small piece of the clay until the paste is of the desired consistency. Add the water gradually (one drop or "spritz" from a mister or brushful at a time), and incorporate each addition of water completely into the clay before adding more. The paste needs to be very thick, similar to the consistency of smooth peanut butter or toothpaste, and no thinner than chilled pudding. Immediately scrape the paste into a small airtight container. Note: Some artists add clay sanding dust to paste; others recommend against it because there might be particles of sanding grit or other impurities mixed in with the clay dust. BRONZclay paste can be stored at room temperature or refrigerated. Originally, darkening on the surface of the paste was believed incorrectly to be oxidation. Because we did not know yet that oxidation was reversed during carbon firing, many artists routinely discarded slip that was more than a few days old. Bill and LaceyAnn Struve explained to me that the dark layer on the surface is not oxidation, but rather tin that has separated out from the clay after water was added to make paste or slip. LaceyAnn says she has a container of year-old BRONZclay paste that still is fine. Just remember to stir the slip or paste well before using it in case any tin may have separated out. Oil paste can be used to attach fired (or leather-hard) pieces of BRONZclay or to repair cracks in fired pieces, similarly to the way Art Clay Silver Oil Paste or homemade PMC lavender oil paste is used with fired silver metal clay (and fine silver metal, such as findings or wire). To make the oil paste, use a palette knife to mash and mix in drops of either undiluted pure essential lavender oil or Sherri Haab PasteMaker solution (available from Metal Clay Supply) into a small piece of lump clay, adding one drop at a time and mixing it in thoroughly until it is a smooth, thick paste the consistency of soft peanut butter. Sherri Haab, creator of PasteMaker, is a well known jewelry artist and author of many best-selling jewelry making and crafting books and DVDs. Her metal clay paste additive seems to penetrate the clay and make the paste smoother and stickier and able to create an extremely strong bond. Oil paste, especially BRONZclay oil paste, takes a long time to dry. Either let the piece air-dry for several days, or dry it at 90°F for 24 hours as Mardel Rein from Cool Tools recommends. Fully-dried oil paste joints or repairs should be reinforced with fresh clay before re-firing the piece. It is extremely important to join BRONZclay attachments securely, as they are under more stress and more likely to come apart during firing than joints or attachments in silver or gold metal clay. Joining this clay to itself securely — especially if both pieces are leather-hard or dry — requires more pressure for a longer time than joining equivalent pieces of precious metal clay. Following are some tips for making strong attachments. Brush a little water on the areas to be joined on both pieces (just enough to dampen the clay). Wait a few seconds for the water to be absorbed into the clay, then add more water or paste and hold together firmly. After 30-60 seconds loosen the pressure and check to see whether the clay from both parts has bonded together well and stays put securely without pressure. For extra security, blend the dampened clay from both parts together thoroughly with a rubber- or silicone-tipped shaping tool (such as a clay shaper) until the clay from both sides is completely knitted together. If the size, shape or type of joint makes it difficult to blend the two pieces together, use bronze clay paste to help you make a secure and seamless attachment. Let the joint dry, then dampen the seam and "caulk" it firmly with tiny snakes of fresh clay (very thick paste can be used, if necessary). Dampen the areas to be joined sparingly, let the moisture soak in for a few seconds, then use more water or paste to attach the pieces. Remember to maintain constant pressure on the joint until you're sure it will hold together on its own. Dampen the seam after the paste dries and reinforce it with fresh clay. Dampen both pieces at the joint area, let the water absorb briefly, then add thin snakes of fresh clay as "caulk" and press the parts together firmly. Use enough fresh clay so that a tiny bit oozes out all around the seam to ensure good contact across the entire surface of the join. You can either smooth out the excess "caulking" with a silicone- or rubber-tipped tool now, or clean it up after the clay dries. If you are joining two pieces in the same plane (e.g., closing a jump ring), use a small clothespin to hold the ends closed until the attachment has "taken." When it's completely dry, check it under magnification to see whether any hairline cracks or gaps have developed. If so, dampen them and fill them with additional fresh clay before firing. 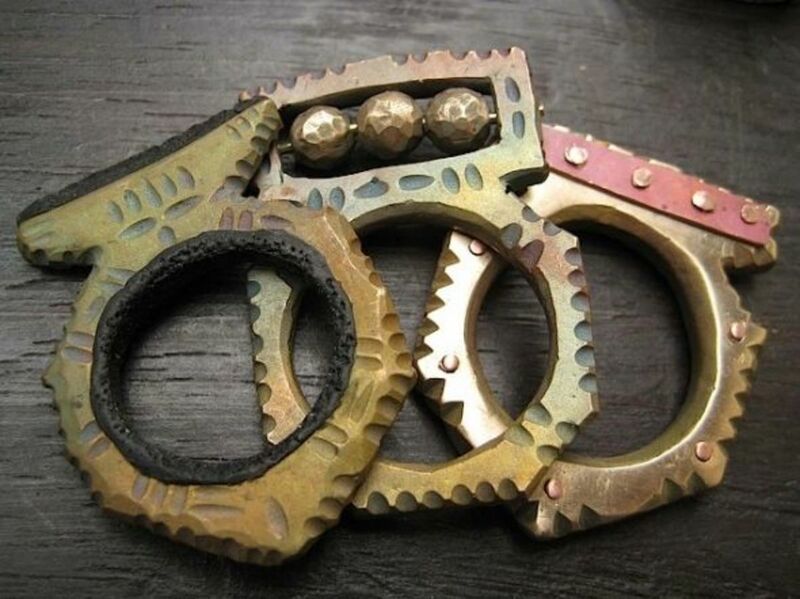 The metal clay "liquid rivet" technique, which I learned from Celie Fago during her "Almost Alchemy" bronze clay workshop, creates extra-strong attachments for difficult joints (e.g., connecting jump rings or other pieces under tension) and joints that require extra strength (e.g., closing rings). To create a liquid rivet, drill small, matching holes in the center of the attachment areas on both pieces to be joined. Dampen both pieces at the joint area (including inside the holes you drilled), wait a few seconds for the moisture to penetrate, then put a little fresh clay between the parts and push them together firmly, so that both holes and the entire seam are tightly packed with fresh clay. Maintain firm pressure for at least 2 or 3 minutes, until the fresh and leather-hard clay parts have bonded together securely. Again, use enough fresh clay so that a tiny bit oozes out all around the seam to ensure a solid attachment across the entire joint area. Remove and/or smooth the excess clay around the joint now or sand it away after it is completely dry. Do not burnish the metal. (If you have done anything to the surface of the clay after removing it from the carbon, use a small, firm scratch brush to roughen the area where the fresh clay will be attached.) Paint a little BRONZclay oil paste on the roughened metal before attaching the fresh clay with firm pressure. (Oil paste is not absolutely required, but it helps keep the fresh clay from separating from the metal as it dries.) Air-dry the oil paste joint for several days, or dry it in an oven at 90°F for 24 hours as Mardel Rein suggests. Re-fire the piece to sinter the joint area fully. Scratch brush the fired part with a small, firm scratch brush where the new clay will be attached. Attach the parts together either with thick slip and fresh clay or with oil paste reinforced with fresh clay after the paste has dried. Hold the parts together firmly for a few minutes (or longer, if necessary for a secure joint). Use any of the drying methods in the Drying BRONZclay section. If oil paste is used, dry it thoroughly. Re-fire the piece, using the longer firing schedule for thicker pieces (if applicable). Either roughen both pieces in the areas to be joined using coarse sandpaper or a fiber wheel on a rotary tool, or score a cross-hatch pattern with a hard, sharp point (such as a scribe). 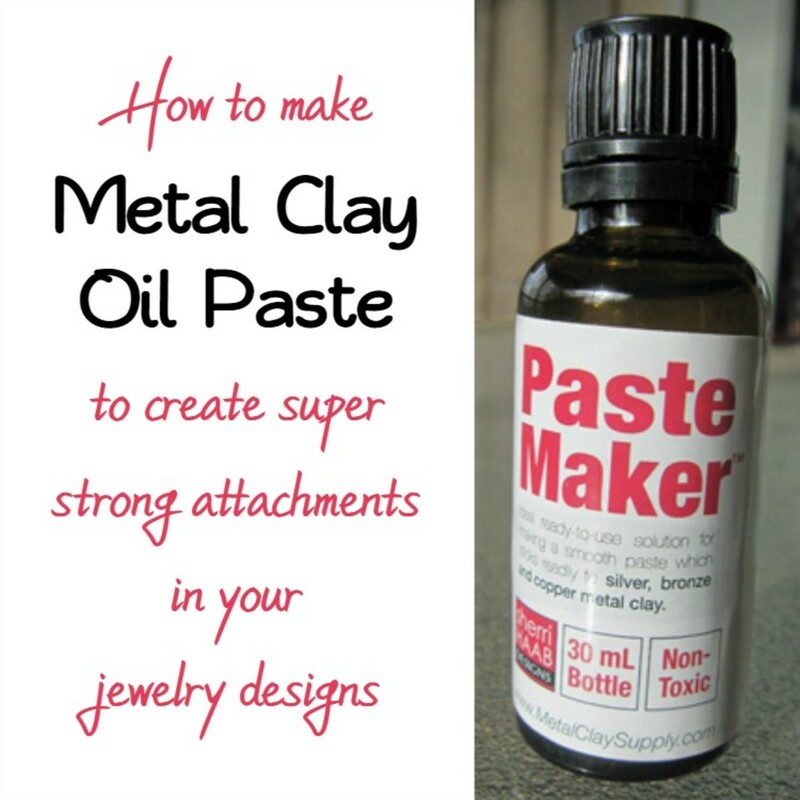 This creates some "tooth" on the metal for the clay or oil paste to grab onto. Attach pieces with fresh clay and feather out the edges of the clay so they're flush with the metal. Alternatively, use oil paste alone (depending on the join) or reinforced with fresh clay after it dries. Maintain pressure on both parts for several minutes or as long as necessary for a secure hold. Dry the joint as above and re-fire. It's a lot easier to reinforce a seam or fill in a hairline crack in unfired clay than to make sure a fresh clay repair will adhere securely to the fired metal. Unlike precious metal clays, BRONZclay remains leather-hard when dry rather than becoming completely rigid. That bit of flexibility can be a significant advantage in certain types of construction. 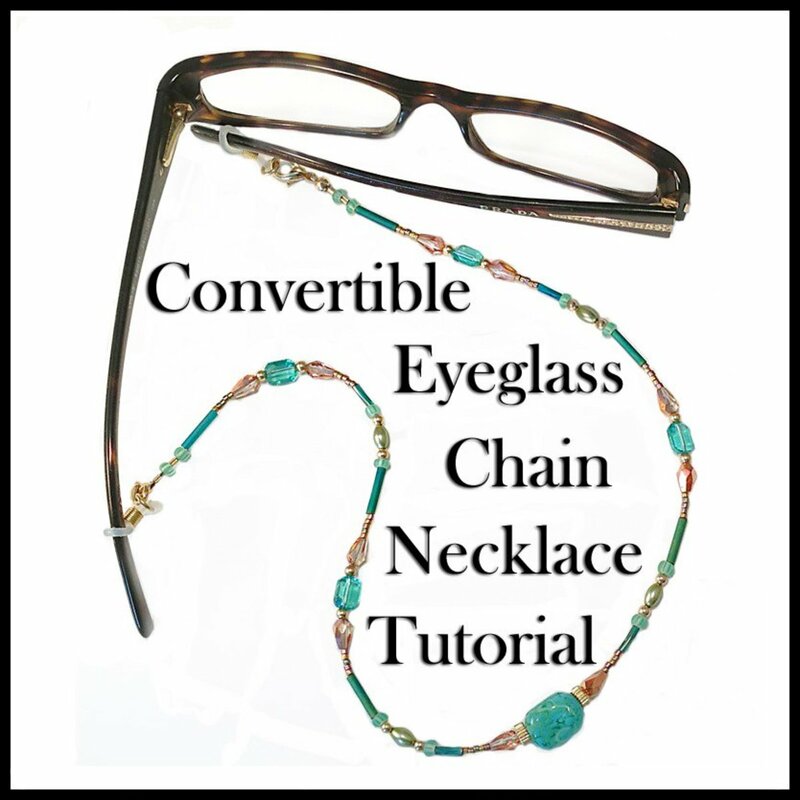 Consider how chains are constructed in silver or gold metal clay. There are two basic options: We can create every other link, let them dry, and then form the intervening links around the greenware links (an approach with several drawbacks), or we can create all the links, let them dry, then slice out a section from half the links, use the open links to connect the closed ones, and then reattach the sections we removed. This method requires making two invisible joints on every other link, and reinserting and attaching each cut-out section so that both ends are in precisely the same plane and orientation as the rest of the link can be challenging. I'm tired just writing about it! 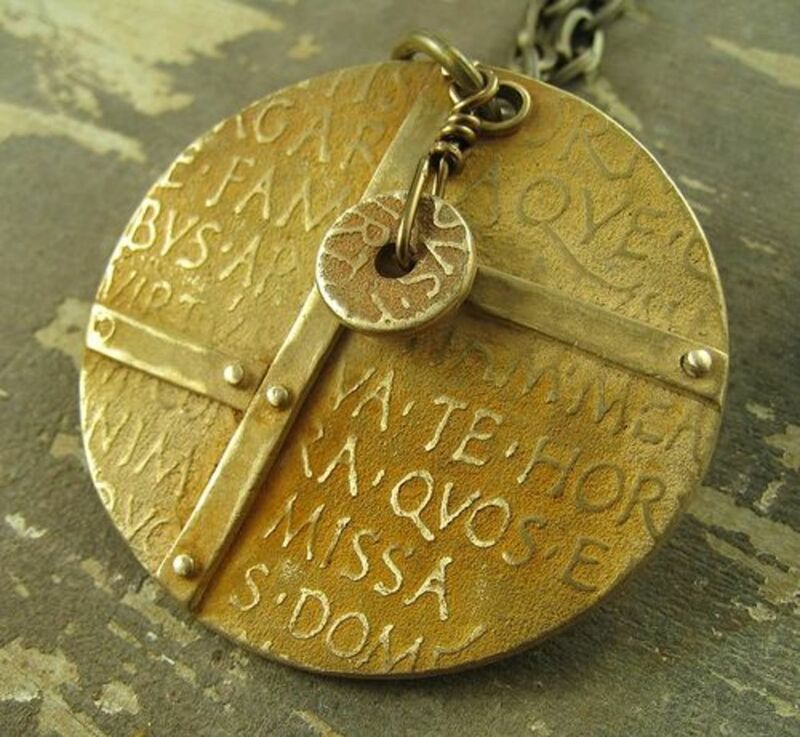 Now consider the comparative ease of connecting links in a BRONZclay chain. Because the leather-hard links are flexible, we can make a single cut in half the links and simply flex the cut ends of each open link apart, creating gap just large enough to slide on the two uncut links to be joined. When we stop flexing the cut ends apart, the tension is released and the ends spring back into their original positions, ready to be joined permanently with liquid rivets. We can make jump rings from BRONZclay because, as with links, the small amount of flexibility in the leather-hard jump rings allows us to twist the ends apart slightly (in opposite directions) until the gap is just wide enough to slide on a charm, earring dangle, bracelet section, etc. When we release the tension holding the cut ends apart, they will spring back to their original positions (adjacent but not closed) and we can flex them closed and hold them in that position while we create "liquid rivets" to join them permanently in the closed position. Start with moist clay by kneading a little water into well-conditioned and wedged clay (preferably fresh from the package). Using a longish piece of acrylic as a snake (coil) roller, quickly roll a long snake of the moist clay. Cover the snake with a very thin film of olive oil to help keep the moisture in. Press and smear one end of the snake onto a clean mandrel (such as a brass tube) (do not apply oil or another clay release agent to the mandrel) so it attaches firmly an inch or two from the end of the mandrel. Continuing to work quickly so the clay doesn't start to dry out, wrap the coil somewhat loosely around the mandrel to allow for shrinkage. Keep the wraps close together (just touching) and stop wrapping when you are at least 1" from the end of the mandrel (so you have someplace to hold the mandrel until the clay dries). When you have wrapped the entire snake (or as much of it as you wish), press and smear the unattached end onto the mandrel so it sticks securely. Brush a little water between the last two wraps on one end of the coil and press them together. Repeat with the last two wraps on the other end. Arrange the mandrel so that nothing touches the coil* and set it aside to dry. Air-dry it or dry it in a dehydrator with low or no heat. When the coil has dried to leather-hard, ease it off the mandrel carefully. Saw or slice through one side of the coil, cutting it into individual rings (just as you would cut a wire coil into jump rings). If you wish, you may slide a piece of round wood rod inside the coil like a mandrel to support the coil as you saw or slice. Either cut into the wood as you saw or slice, or slide the rod back gradually so it's always slightly in front of the saw blade to support the uncut coils. Flat links are made the same way as they are in silver clay, except that the clay sheet should be rolled thicker (roughly 10 cards thick is recommended). Roll out a sheet of clay, texture it if you wish, then cut out "washer" shapes using two oiled cutters of different sizes. To join the leather-hard links, make a single cut on one side of every other link. Partially rehydrate the cut links by dampening them and letting the water absorb into the clay (30-60 seconds). As soon as they are flexible, flex them open gently to connect the dry, uncut links, then seal the cut edges closed. Dimensional links are made the same way as jump rings, except with thicker clay snakes (and usually on larger mandrels). Joining Jump Rings and Links with "Liquid Rivets"
BRONZclay jump rings have a memory and will spring back into their original leather-hard shape unless they are flexed closed and held under tension (similar to coiled memory wire). Use the metal clay liquid rivet technique to join the cut ends of jump rings securely. Because of this "memory," when making liquid rivets in bronze clay jump rings the ends must be held closed under tension for a considerable time (anywhere from 5 to 30 minutes) to make sure the joint doesn't pull open before it has dried completely. Check the joint periodically; when it no longer starts to pull apart after you remove the tension, replace your fingers with a small clothespin that will continue to hold the joint closed until it is thoroughly dry. Thanks to Celie Fago for teaching me how to make BRONZclay jump rings, links and liquid rivets. BRONZclay is more prone to warping than fine silver clay, especially if it is dried directly on a cup warmer, hotplate or other heat source. Drying with direct heat is recommended only if you want to achieve some warping and cracking for a particular look. 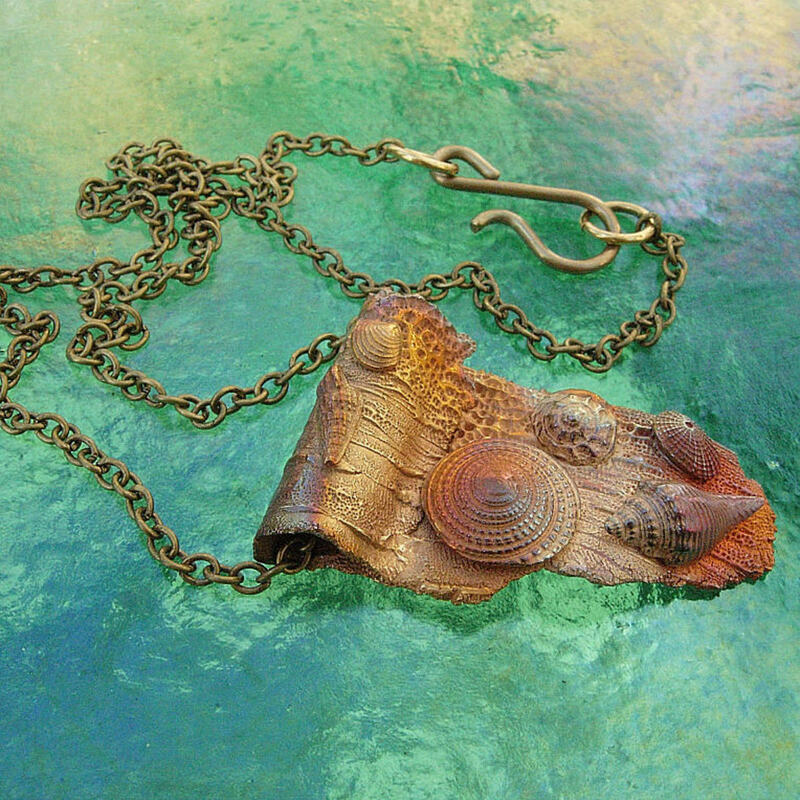 Gail Lannum uses this technique to give some of her pieces a more ancient look.) You can air-dry your clay, dry it in a dehydrator (preferably with low heat or no heat), or even in the refrigerator or freezer (thanks to Mardel Rein for the cold drying idea). One way to reduce the amount of warping in any type of metal clay, regardless of how you dry it, is to roll out and texture the clay on a piece of non-stick sheet, cut out the desired shape, and dry it without moving it from the non-stick sheet or turning it. (If you're using heat, don't turn the piece until the side facing the heat is completely dry.) The slight friction between the fresh clay and the non-stick sheet helps keep the clay tacked to the sheet a bit, which helps counteract warping somewhat. If a flat piece warps anyway, you can flatten it easily by spritzing the concave side (curving inwards) with a little water, allowing it to absorb into the surface for 30-60 seconds, and sandwiching the clay between two pieces of non-stick sheet. Weight it down with a large dictionary (or 2-3 slightly thinner books, or a book topped with a bench block) for about 20 minutes. Repeat the process if necessary. If the clay starts to dry out while you're working with it, you'll need to work some moisture back into it. This helpful video from Cool Tools demonstrates the process for rehydrating BRONZclay. Those of us who have worked with silver or gold precious metal clay know how much easier it is to sand, file, shape and perfect pieces while they are still in their clay state than after they have been fired, when they are pure metal. Nonetheless, most problems or mistakes are not very difficult to correct even after firing. Pure gold or fine silver are relatively malleable metals. They can be formed, reshaped, filed, sanded and even sawn without a lot of time or effort. Roughing up the surface of the metal where repair clay will be added, if necessary, is quick and easy. Fired BRONZclay is much less forgiving. Many issues, including the hardness of bronze metal and the inability to re-fire pieces containing both bronze clay and silver clay, make it more important to "get it right the first time" when working with this formula. Fired pieces certainly can be repaired, and some repairs are just as easy as they would be in silver clay. However, the options are more limited and require much more time and effort than you may be used to if you've been working with silver clay. This will help you identify and repair/reinforce hairline cracks, bubbles, pinholes, gaps in joints, and anything else that can affect the piece's appearance or, more importantly, its structural integrity; any problems are guaranteed to get worse during firing. Lightly dampen the repair area with distilled water, let it penetrate the clay for a few seconds, and press fresh clay firmly into the crack or seam. Be careful not to trap any air underneath the fresh clay. If the location of the crack of gap prevents you from filling it with fresh clay, use very thick paste instead. Overfill the repair to allow for shrinkage as the fresh clay or paste dries; you can sand the excess clay flush with its surroundings once it has dried. If your repair is in the middle of a texture, do your best to recreate the missing texture on the dried repair using carving gouges, files, clay shapers, Colour Shapers, etc. These will come apart during firing if the clay from both pieces is not knitted together securely and reinforced sufficiently when dry. See the section on Joining and Making Secure Attachments. There are many methods for pre-finishing the surface of BRONZclay greenware, including sanding with salon boards, sanding sponges or sandpaper, burnishing with an agate (or other) burnisher in the areas you plan to polish later, and/or smoothing the surface with a wet wipe or baby wipe. Lora Hart of Lora Hart Jewels tells her students that the fine level of pre-finishing often recommended for silver clay greenware is not required when working with BRONZclay, which "develops a very slight tooth when firing." She says she rarely uses sandpaper finer than 320 grit (and never uses anything finer than 400 grit) on the greenware. If you're satisfied with how your piece looks under magnification at this stage, you're likely to be pleased with it after it's fired, too. Inspecting, repairing and reinforcing your pieces in the greenware state will pay big dividends in both the structural integrity and the appearance of your finished bronze pieces. Pieces made from any base metal clay (or precious metal with a significant amount of alloy, such as PMC Sterling or PMC Pro) need to be surrounded completely by activated carbon in order to sinter properly. The activated carbon displaces air/oxygen that could hinder the sintering process. A certain amount of air/oxygen is needed inside the container to support combustion of the binder, but it must be above the carbon so that the metal clay is not directly exposed to it. Spread a 1/2" to 1" deep layer of activated carbon in the bottom of the firing pan. Arrange your greenware pieces on the carbon, keeping them 1/2" away from the walls of the pan. If you have a front-loading muffle kiln, there is no heating element in the door, so do not place pieces towards the front of the pan. Note: Some front-loading (fiber/muffle) kilns have heating elements only on two sides. Arrange your pieces only on the sides that have heating elements. Arrange the pieces in a single layer so they are spaced at least 1/2" apart; larger pieces should be placed farther apart. If you wish to fire additional pieces in the same load, add another layer of carbon at least 1/2" thick and arrange another layer of greenware on top, again making sure that all pieces are spaced at least 1/2" away from the walls of the container and at least 1/2" apart from each other both horizontally and vertically, with more distance for larger pieces. If you are using a tall pan, you may add additional layers of carbon and greenware, if you wish. Cover the top layer with another 1/2" layer of activated carbon, making sure not to fill the container too full. There should be at least 1/2" of air space at the top, preferably more. Cover the container with its lid slightly ajar or vented (or use a vented lid) and place the firing pan on kiln posts or broken pieces of unglazed ceramic tiles (NOT on a kiln shelf) to improve heat circulation, aligning the center of the pan horizontally with the heating elements. Make sure the pan does not touch the thermocouple. Fire according to one of the BRONZclay firing schedules in the next section. Tip #1: Position greenware pieces — especially hollow forms — in an orientation that minimizes the likelihood of distortion or sagging during the firing process (e.g., position lentil beads vertically in the activated carbon; place domed discs horizontally with the opening face up in the carbon, like a bowl). Tip #2: Draw a "map" of the pieces and their locations in the pan for each layer of greenware as you load the pan. This will make it much easier to find them later (and to make sure you don't accidentally leave any pieces in the carbon). Tip #3: Arrange pieces nearest the walls of the container first, where they will be nearest to the heating elements. Then add additional pieces closer to the center, if you wish, before adding one or more optional layers of carbon and greenware (if your pan is tall/deep enough). Tip #4: If you are firing matching or coordinating pieces (such as earrings or a box and its lid), place them in the same layer and orient them in mirror image (i.e., the same distance from the center, nearest side, and back of the firing pan). This allows both pieces to be fired in as similar conditions as possible, increasing the likelihood that they will come out close to the same size (and, possibly, patina). 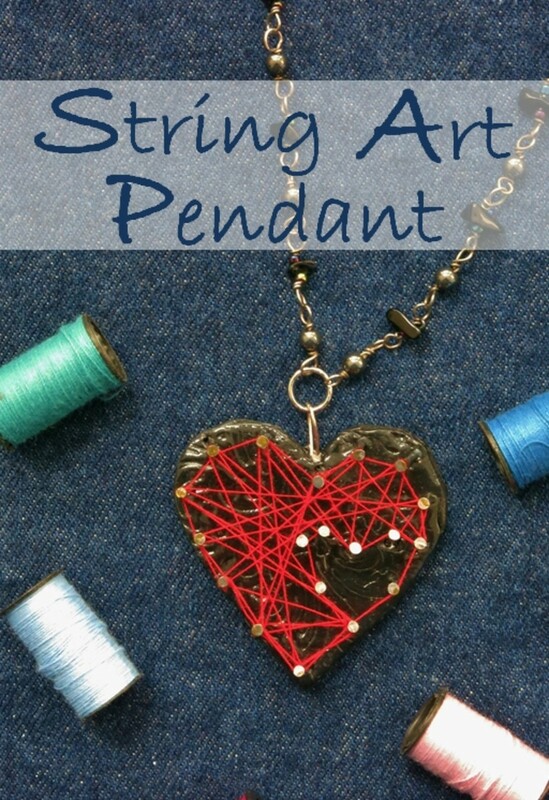 Tip #5: If you have small pieces with hanging holes or other openings (e.g., charms), consider threading them loosely onto a piece of bronze, brass or stainless steel "finding wire" and twisting the ends (like a twist-tie) before placing them in the pan. This makes small pieces much easier to find and retrieve after firing. 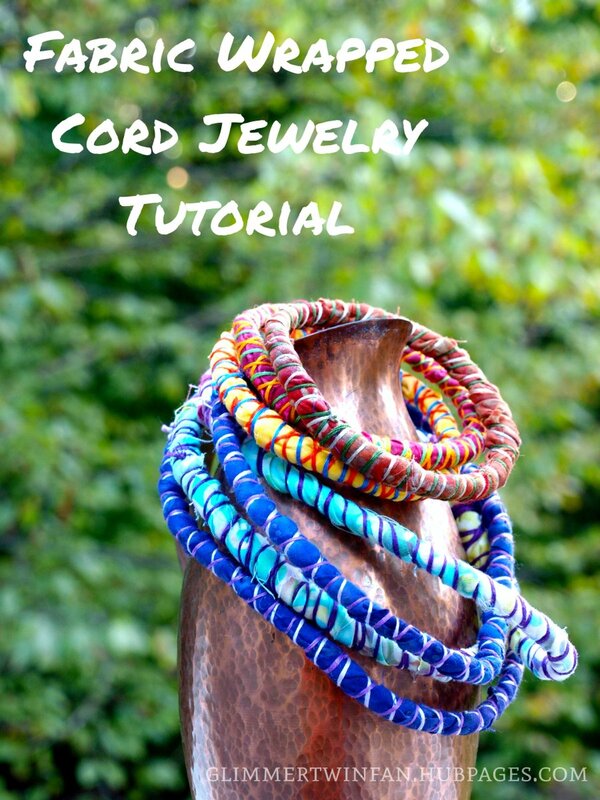 Cut the wire long enough so that you can arrange the strung pieces at least 1/2" apart in the carbon. Use kiln posts (or broken pieces of unglazed ceramic tile) to raise the pan nearly to the top of the kiln. Don't set the pan on a kiln shelf, since the purpose of elevating the pan is to maximize the circulation of the hot air around all sides, including underneath the pan. Check to make sure the thermocouple still sticks out after the firing container is in place. BRONZclay firing schedules are not foolproof. You may need to make adjustments based on your kiln type and model, and even idiosyncrasies of your particular kiln, such as hot spots. Firing sample strips of clay can help you test and adapt a firing schedule for your individual kiln. You also might want to include a test strip in a particular kiln load that contains a piece that's thicker than your usual work, so that you can test the sample for full sintering rather than risking your designed piece. Some artists routinely make test strips whenever they're making a particularly important piece or firing a large number of pieces so they can test for full sintering without ruining their work. Roll clay as thick as your thickest typical pieces (or as thick as the thickest piece in a particular kiln load). Cut strips roughly 3/4"–1" long and at least 1/4" wide. While you don't need to put any effort into refining or texturing your test strips (which are designed to be put under stress), you may want to try Gail Lannum's approach. For each kiln load she wants to test, instead of making throwaway test strips, she cuts pairs of matching, textured, long rectangles with a hole at one end of each piece. This takes minimal extra effort, and if the samples pass the stress tests, she gets a simple pair of earring drops as a bonus. To test a new or adjusted firing schedule, make 3-5 identical test strips. Place a test strip in the middle and a strip near each of the 2, 3 or 4 sides (depending on your kiln type) that will be next to a heating element. This will help you identify any hot or cool spots in your kiln, based on differences in shrinkage and strength/density after firing. If you are creating a test strip for an unusually thick piece in a particular kiln load, place the test strip next to that piece in the firing container, separated by an appropriate amount of carbon (thicker pieces should be arranged farther apart than thinner ones). Follow the steps in the Strength/Stress Testing section. If the fired test strips bend or break easily, you will need to adjust the firing schedule and fire another round of test strips. If the strip was included with a load of designed pieces, run them through another firing cycle. IMPORTANT! Even if the test strips pass your stress tests, that doesn't necessarily mean that all the pieces in the same kiln load have sintered fully also. Several factors that affect sintering can vary from one piece to another in the same kiln load, such as placement in the firing container and the amount of carbon between and around different pieces. Use test strips only as an indicator, not a guarantee that the entire kiln load has sintered fully. Base metal clay silver alloy clay formulas are much are much less tolerant than fine silver clay formulas when it comes to the conditions in which sintering can occur. Temperature adjustments of even 10°F (12°C) can mean the difference between perfectly sintered pieces and under- or over-fired ones. Keep detailed notes so you can adjust firing schedules for your particular kiln. Not all kilns were designed to maintain high temperatures for many hours at a time. Repeated nine-hour firing cycles can shorten the life of your kiln. Be sure to ask the manufacturer of your kiln (or a knowledgeable supplier) what effect these prolonged, high temperature firings are likely to have on it. Also, the type of kiln you have will help determine your optimal firing schedule(s). Kiln brick retains heat much longer than fiber/muffle walls. Top-loading (brick) kilns have firing elements on all sides for better heat distribution vs. front-loading (fiber/muffle) kilns, which have elements on only two or three sides. Regardless of the firing schedule you use, if you are firing thin and thick pieces in the same kiln load, always use the longer, slower firing schedule needed for the thickest piece. Also, activated carbon will stay hot for many hours after the firing cycle has ended. NEVER use your fingers to remove your pieces from the carbon, and ALWAYS remember to wear appropriate protective gear when working with hot kilns or firing pans! For either firing schedule, allow the pan to cool completely (preferably inside the kiln) before removing the lid and unloading the pieces. If you need to use the kiln to fire another load, I recommend opening the kiln door a crack and leaving the firing container inside until the temperature has dropped to less than 300°F (150°C) before putting on heatproof gloves such as welding gloves and lifting out the firing container and placing it on a heatproof surface to finish cooling before removing your pieces. Unlike the well-established, reliable firing schedules for precious metal clay, no firing schedules have been developed for BRONZclay that produce consistently successful results every time for all metal clay artists in all kilns for all of pieces, regardless of size or shape. Over time, more and more metal clay artists have been moving to a two-phase firing schedule, an open-air firing to burn out most of the binder followed by a carbon firing to sinter the metal particles. However, some artists continue to use single-phase carbon firing schedules. Following are synopses of a few firing schedules that have been tested extensively and appear to have produced good results fairly consistently for a significant number of metal clay artisans. I encourage you to read the steps carefully before testing and adjusting these firing schedules for your own kiln. IMPORTANT: Covering the firing pan with a lid is not required, but it helps prolong the life of your kiln's firing elements and also helps conserve your carbon supply significantly by minimizing the amount that turns to ash during firing. Lids should be vented, either by using a lid with an opening in it (for example, a built-in slot in a covered steam tray lid for accommodating a spoon, or one or two small slots cut into a solid lid) or by setting the lid slightly ajar or propping it up at one corner with a small piece of a kiln safe, noncombustible material, such as a scrap cut from a Solderite board (a trick I learned from renowned metalsmith and metal clay expert Tim McCreight). Program the kiln to ramp at 500°F (278°C) per hour to 1550°F (843°C) with a hold time of 2 hours. Total firing time, including ramp time, will be approximately 4 –5 hours. Program the kiln to ramp at 250°F (139°C) per hour to 1550°F (840°C) with a hold time of 3 hours. Total firing time, including ramp time, will be approximately 9 hours. Following are some additional firing schedules that have proven successful. Like many other metal clay artists and instructors, Celie tested a number of different firing schedules in search of a shorter schedule that would result in consistently successful sintering but she had mixed results. Eventually she decided to return to her most reliable variation on the original "official" firing schedule. Although it requires roughly 9 to 9-1/2 hours (plus cooling time), Celie has fired hundreds of pieces this way and has found that it produces strong, fully sintered pieces consistently. She uses the same firing schedule regardless of the thickness of the pieces being fired. Ramp at 250°F (139°C) per hour to 1516°F (825°C). Hold at that temperature for 3-1/2 hours. Cool to at least 300°F (150°C) or cooler before unloading. 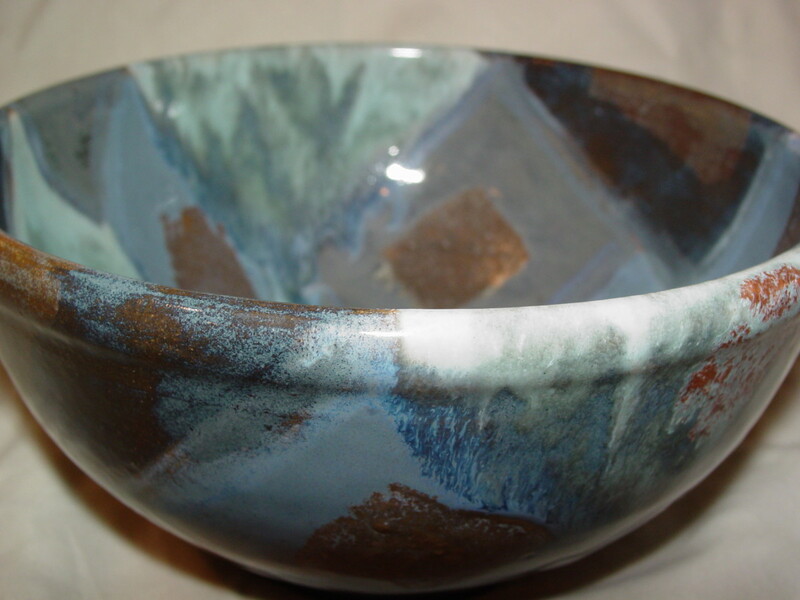 Celie has used acid washed coal activated carbon for firing BRONZclay without problems. However, because of the way it's made, coal carbon is much less consistent from batch to batch than coconut carbon, so if your particular bag of coal based carbon isn't producing consistently sintered pieces you may want to switch to coconut carbon. Mardel Rein from Cool Tools was the first person to work on finding a successful shorter BRONZclay firing schedule, to publish the findings from her extensive experiments with the new material, and to develop a successful firing schedule based on clay thickness. Her approach factors in not only clay thickness and kiln type but also kiln wattage and size, making it possible to determine the optimal firing schedules for pieces of a specific thickness in a specific kiln model. She has found it to be consistently reliable even when firing very thick pieces, and has sintered pieces as thick as 16 mm using this approach. Mardel's method involves identifying the target maximum temperature and hold time based on your kiln's wattage and size, determining the ramp rate based on the thickness of the pieces you are firing, and selecting a cooling method based on the type of kiln (brick vs. muffle). Mardel's firing schedule and other helpful information including her BRONZclay firing instructions PDF are on the Cool Tools site. Fired BRONZclay that is cooled too slowly or too quickly can become brittle. To avoid this, Mardel recommends the following cooling methods. Important: After the kiln has completed the firing program, do not turn off the electronic temperature controller until you are ready to remove the firing pan according to one of the following methods. For top loading kilns, slide the kiln lid 2"-3" to one side to allow the heat to escape. Let the kiln cool to 1000°F (538°C), then remove the kiln lid and uncover the firing pan. Either let the fired pieces finish cooling in uncovered pan in the open kiln, or remove the pieces with a slotted spoon and quench them in water, if you wish. Important: DO NOT quench pieces that contain embedded stones of any type. Also, Mardel warns that quenching BRONZclay at temperatures above 1000°F (538°C) may result in brittleness. For front loading models, open the door about 1", and wait until the temperature controller reads 1000°F (538°C) or lower before opening the door all the way. Either uncover the firing pan and leave it in the open kiln to finish cooling, or remove the covered pan, place it on a trivet and allow it to continue cooling for 20-30 minutes before uncovering it. Alternatively, if the fired pieces do not contain any embedded stones, you can remove them from the carbon with a slotted spoon and quench them in water, if you prefer. For ceramic fiber kilns, either crash cool as above or leave firing pans to cool to 1000°F (538°C) or cooler in the closed kiln. Many metal clay artists prefer to use a two-phase firing schedule to ensure that the binder is burned out completely for full sintering. Hadar Jacobson was the first person to add a preliminary firing phase in an environment with oxygen present to facilitate the burnout of the binder. The initial recommended firing schedules for BRONZclay were carbon-only firings. However, in the Spring of 2009, Bill Struve asked several people to help test a new firing schedule that included a preliminary open-air firing at the suggestion of Darnall Burks, a physicist and engineer who, together with Tim McCreight, co-founded the PMC Guild. It helps the binder burn out completely. It enables wood clay, cork clay and other combustible cores to be used successfully with BRONZclay. It enables sintering temperatures in the carbon to be reduced, thereby eliminating blistering and other heat-related problems. It enables more complete sintering and eliminates crumbly/powder interiors. It removes the wax or other resist used in the water etching technique. Bangles are stronger when fired with a schedule that includes a preliminary open-air firing phase. If the clay cracks or breaks, it can be repaired at the open-air firing stage. Cracks often form during the preliminary firing stage. If these are structural flaws, having them visible at this stage rather than after a multi-hour carbon firing is an advantage. Repair the cracks and repeat the open-air firing, then move to the carbon firing phase(s). If cracks appear routinely using this method that do not appear with a carbon-only firing schedule, try slowing down the ramp rate during the open-air firing phase. During the preliminary firing, the pieces will turn black from the oxidation of the copper in the clay. Don't worry — the oxidation will burn off completely during the subsequent firing in activated carbon. After the preliminary open-air firing, the pieces will be fragile, so be careful when transferring them from the kiln shelf to the carbon filled firing container. Place the greenware directly on a kiln shelf. Ramp the kiln at 450°F (250°C) per hour to a target temperature of 555°F [290°C] and hold for 1 hour. Allow to cool. First stage: Ramp the kiln at 520°F (290°C) per hour to 480°F (250°C) (or to 700°F (370°C) if you are co-firing it with copper clay) with a 1 hour hold time. Second stage: Ramp the kiln at 1690°F (940°C) to a target temperature of 1470°F (800°C) (or to 1560°F (850°C) if you are co-firing it with copper clay). Hold 3 hours. Cool. Tonya Davidson collaborated with the experts at kiln manufacturer Paragon Industries to see how kiln ramp rates could be shortened successfully. Based on their experiments, they determined that the last 300°F (150°C) of the heat work (the combination of heat and time that cause the material sinter fully) are the most important. They found that a very slow ramp is needed during the last 300°F (150°C) of reaching the target temperature in order for BRONZclay to sinter fully. Tonya's schedules take into account both the thickness of the clay and the type of kiln (brick vs. muffle). Place the bronze clay greenware on a kiln shelf in the kiln. Ramp the kiln at 250°F (139°C) per hour to 550°F (825°C) with a hold time of 30 minutes. First stage: Ramp at full speed to 1100°F (593°C) with a hold time of zero. Second stage: Ramp at 250°F (139°C) per hour to 1490°F (810°C) for a brick kiln or 1516°F (824°C) for a ceramic muffle kiln with a hold time of 2–3 hours, depending on the size and thickness of your piece. Lower the target temperature for your kiln if you get bubbles, bumps or dents in the fired clay. Stan and Heather Micallef of Dragon Glass in South Africa report consistently successful results with their modification of the original open-air firing schedule. "We found when making big cork clay items, you need the hour to properly convert it to ash; the flash firing can be shortened if there is no cork clay, paper, etc. to burn out. However, [we find that] it is SO much easier to put just one firing schedule into the kiln, and use it for everything!" IMPORTANT! The Micallef's studio is at a higher elevation than most, (Johannesburg is higher than 6000 feet above sea level), so their temperatures are somewhat high to compensate for the higher elevation. Most people will need to lower the temperatures, especially those who are working near sea level. Place the greenware directly on an open kiln shelf. Ramp the kiln at 450°F (250°C) per hour to a target temperature of 720°F (385°C) and hold for 60 minutes (1 hour). Note: The Micallefs call this preliminary open-air firing "flash firing." They have found that using a 1-hour hold time makes the pieces less likely to break when transferred to the carbon or handled for repairs. They also found that a longer hold time makes any cracks or flaws more visible so they can be fixed. If you make repairs, repeat the "flash firing" phase before proceeding. First stage: Ramp at 630°F (350°C) per hour to 685°F (366°C). Hold at that temperature for 90 minutes (1.5 hours). Second stage: Increase the temperature at a ramp rate of 990°F (550°C) per hour to 1544°F (840°C). Hold for 165 minutes (2.75 hours). Cool. Bubbles, melting, loss of detail, and surface graininess (almost like reticulation) can be indications that the target hold temperature was too high. Try reducing the temperature by 10-15 degrees at a time until those symptoms disappear on test strips as thick as the thickest part of the original piece. A hard outer shell with a powdery interior could mean that the outer portion of the clay sintered before the interior had a chance to do so. Try firing a test strip as thick as the thickest part of the original piece, but reduce the ramp rate to increase the temperature more slowly. You also may need to extend the hold time at the target temperature. Another possible interpretation is Mardel Rein's: "The hard outer shell with a powdery interior [indicates] a total sintering failure...there was not enough oxygen to combust the binder entirely." Try adding a preliminary open-air firing phase to your firing schedule. If your fired piece breaks or cracks when bent or hammered after firing, there are several possible causes. It might have become brittle from improper cooling (see Mardel's tips for crash-cooling fired clay on the Cool Tools site). It might have been over-fired. Or it might have happened because you didn't anneal the metal before subjecting it to significant stress. Bronze is very hard and, like many metals, it should be annealed* before working it. If the metal was properly annealed and the break area is metal (not powdery) all the way through, the break may have been the result of incomplete sintering. Try firing a test strip of the same thickness and increase the hold time at the target temperature by another 1/2 hr. to 1 hr. If that doesn't solve the problem, try adding a preliminary open-air firing phase and fire another test strip. Mardel wrote a BRONZclay Troubleshooter on the Cool Tools site that includes photographs of several firing problems and her recommended solutions. *To anneal bronze, heat the metal until it is a dull red color. Remove the heat and, as soon as the redness disappears, quench it in cold water. Be careful not to overheat the metal or to wait too long before quenching it. After you remove your firing container from the kiln, you will need to find your fired pieces and fish them out of the carbon with a long-handled slotted spoon, tongs, and/or your fingers. Some of the carbon will have turned to dust and some may burn away. Ashes can form on top of the carbon, especially if you have fired with the lid ajar or without a lid (for example, if you use Hadar's preliminary open-air firing method). Any ashes that have formed on the carbon should be removed before re-using it. You can vacuum the ashes gently from the top surface before pulling out your fired pieces. Keep the vacuum nozzle far enough above the pan so that only the ashes (and not carbon or bronze) will be pulled into the vacuum. Carbon dust and ashes, if any, can be sifted out by pouring the carbon (complete with your fired pieces) well-ventilated area.onto several thicknesses of newspaper. Do this outdoors or in an extremely well ventilated area, and work on a surface that is no higher than your waist (on the ground or grass is best). To avoid breathing the fine carbon dust that is dispersed into the air during sifting, wear a dust mask or particulate respirator for this procedure. Pour out a small amount of the carbon (and your fired pieces) onto the newspaper. Retrieve your pieces from the carbon, then repeat the process, pouring out carbon successive layers and retrieving your pieces as you go. If you are outdoors and there is a gentle breeze, it will blow away the carbon dust (and ash, if any) as you sift. Otherwise, use a large mesh sieve to sift the dust and ash from the carbon before storing it for future use. Add some fresh carbon to each new kiln load to replace whatever portion was lost during the previous firing. Kevin Whitmore of Rio Grande recommends replacing fired carbon completely with a fresh batch after every 100 hours of firing. It's a good idea to vacuum the inside of your kiln after every carbon firing. Be careful not to touch or dislodge the thermocouple. Try to push a needle tool into the surface of the fired piece in several different places. Push hard! If the piece is fully sintered, the needle tool shouldn't be able to poke a hole. If the tip penetrates, repair the pin hole, if necessary, and re-fire the pieces in that kiln load. If your piece survives the needle tool penetration test, sand or buff away the topmost layer in a small area with coarse sandpaper or a fiber buffing wheel. If the hard outer shell is thin and buffing reveals unsintered powder underneath, return all pieces you removed from the pan back into the carbon and re-fire them. Then repeat the sanding or fiber wheel buffing test on another area of the piece. If you are testing a new or adjusted firing schedule, make further adjustments if necessary and fire a new batch of test strips. Next, tap your piece with something hard and made of metal, such as a tool or utensil, and listen to the sound it makes. A dull thud indicates incomplete sintering. A tinkling or ringing sound is a good indicator that the material has sintered fully. If buffing does not reveal a powdery core, try to make a small bend in the piece to see whether it cracks or breaks. If it cracks or breaks easily, it has not sintered fully. A broken piece that shows powder in the center may indicate that the ramp rate should be slower for your kiln. A broken piece that is solid metal across the entire cross-section indicates that the piece has sintered partially all the way through, but not completely (i.e., not to its highest density). This can indicate the need for adjustments to the target temperature and/or the length of the hold time in your kiln. Properly sintered BRONZclay pieces have a high density that can withstand more forceful strength testing, if you wish, such as trying to bend fired sample strips with two pairs of pliers and/or hammering them to see whether they break or crack. Keep in mind that even fully sintered BRONZclay (bronze metal) will crack or break under excessive force if it has not been properly annealed first. Note: There are different schools of thought on how much strength/stress testing is necessary for fired metal clay pieces.Do whatever amount of testing will make YOU feel comfortable that your pieces will not break when subjected to reasonable wear and tear. Fixing Breaks, Filling Holes or Cracks, Etc. Pieces made from BRONZclay are more likely than their silver clay counterparts to develop cracks or fissures during firing, especially if the kiln is ramped too quickly. Repairing fired bronze pieces — filling holes or cracks, reattaching broken pieces, etc. — is very similar to repairing silver clay. If bubbles, holes, cracks or joint gaps have developed during firing, repair the metal in its "pristine" state straight out of the kiln. If problems develop while you are finishing the piece (e.g., a bubble is uncovered during sanding, filing, etc. ), clean the area to be repaired thoroughly and create some "tooth" with coarse sandpaper or with a coarse fiber wheel on a rotary tool or flex shaft. Use conditioned clay straight from the package (vs. re-using scrap clay) for maximum strength. If you need a slightly moister consistency for the repair, knead a little extra water into the repair clay. If you wish, you may apply a little BRONZclay oil paste to the prepared repair area on the metal before adding the fresh clay. Make sure the oil paste (if used) is completely dry before re-firing the piece at the longest firing schedule. Remember that the fresh clay will shrink as it dries and as it fires. Either overfill your repairs slightly or plan to re-fill and re-fire your breaks, cracks, holes, etc. a third or fourth time, as needed, so the repaired area is flush with the rest of the piece. How to Make "Creative Repairs"
When one of Barbara Becker Simon's pieces breaks, she sometimes "makes lemonade from the lemons" by taking the opportunity to add new design elements. When one of her carved bronze clay bangles broke, she reattached the pieces with large cubes of fresh clay, allowed them to dry, and carved them to complement the rest of the design before re-firing. The photo above shows the repaired bangle with the added carved, cube-shape "nodes". Barbara explained that "The reason these 'boxes' worked is that the new clay surrounded and clamped on to the ins and outs of the nasty break, thereby covering up all the ugliness and making a joint that was secure. Even though I accounted for shrinkage by making the nodes larger, I still had to go back and re-caulk and re-fire cracks that developed on the boxes, in some cases more than once. But I felt it was worth it to save a piece on which I worked a long time." Adding fresh clay "nodes" in various shapes isn't Barbara's only trick for salvaging badly broken pieces. At first, the larger bangle shown below looked like it might be beyond repair. Barbara was trying out a faster firing schedule and one of the large rectangular cubes "just completely took a dive." This fabulous bracelet represented a lot of work, so she salvaged it by grinding down the ruined front and back surfaces of the cube and created new "faceplates" (my term) to rivet on later. Re-fire both/all the pieces, not just the one(s) you repaired, so that any incremental shrinkage in the second firing will affect all the matching pieces. Never re-fire pieces that contain both bronze and silver! See the section on Combining BRONZclay and Silver Clay for more information. Finishing Techniques, Part One: Shaping, Wire Brushing, Polishing, Etc. Bronze clay is extremely hard after firing and cooling, if the pieces have sintered fully in the kiln. Lora Hart explains that bronze becomes heat-hardened if it is heated to a high temperature and allowed to cool slowly. If you need to shape the bronze metal, she recommends annealing it first by either quenching or crash cooling the hot metal rapidly. Celie Fago advises her students to leave the firing pan in the kiln after the heating cycle is complete (cracking the door open, if they wish) until it has cooled to below 300°F, remove the pieces from the carbon, and let them cool to room temperature. If annealing is needed, reheat the metal with a torch to a dull red and quench it. Finishing fired BRONZclay (unlike finishing fired silver clay) is entirely optional. Pieces look great straight from the kiln. If you want a different finish, or if you want contrasting finishes (for example, wire brushing for a soft satin finish or polishing the high points on a texture), you can use most of the same methods as you would use on fired silver clay. The main difference is that finishing bronze metal requires more time and effort because it is much harder than fine silver. If you plan to wire brush a fired bronze clay piece for a satin finish, both Celie Fago and Lora Hart recommend using a soft brush with stainless steel bristles. Most (though not all) metal clay artists use brass brushes on fired silver clay because brass bristles are less likely to scratch the soft fine silver. However, steel bristles are more effective on the hard bronze metal. Lora likes using a mounted stainless cup brush on her flexible shaft tool "to finish bronze to a nice golden color." Celie uses a 3-inch steel-bristle brush on a polishing lathe in her studio and a steel-bristle hand brush when she teaches. Either works fine; motorized brushing is just faster and more efficient. Note: As always, remember to wear proper protective gear when working with power tools. You can use a mild abrasive, such as pumice, for a soft, not bright, shine. Dip a damp finger or a baby toothbrush into the pumice powder and rub the metal in small, tight circles until the desired shine is achieved. For a brighter shine, Celie polishes her fired bronze pieces with 600-grit (gray) 3M Tri-M-Ite micron-graded polishing paper wrapped around a salon board (vs. the much finer 1200-grit micron-graded polishing paper she uses on fired silver clay). She doesn't bother with wire-brushing before polishing. Many artists, including Tonya Davidson, Linda Kaye-Moses and I, love the 3M micron radial bristle disks. The disks come in large sizes that fit on a polishing lathe and small sizes for use with a flexible shaft or other rotary tool. Holly Gage of Gage Designs also likes using rubber polishing wheels and points, such as the AdvantEdge brand from Rio Grande. You can burnish your pieces in a tumbler with stainless steel shot, if you wish. Kiln patinas develop in the reducing atmosphere created by the hot activated carbon granules in the firing pan. If you don't like the kiln patina on certain pieces, you can try re-firing them along with your next kiln load of BRONZclay. For best results, wire-brush (and burnish, if desired) before re-firing the pieces. To paraphrase Forrest Gump's mama, firing bronze clay (especially in coal-based carbon) "is like a box of chocolates. You never know what you're gonna get." And the colors from the first firing are guaranteed to change — unpredictably, of course — so there's a 50/50 chance that whatever you put into a second firing will come out looking better than it did going in. There's no downside to trying it, and if you still don't like what you see you always move on to other heat- or chemical-based patinas. While the patinas on BRONZclay straight from the kiln can be very attractive, they are completely outside your control. 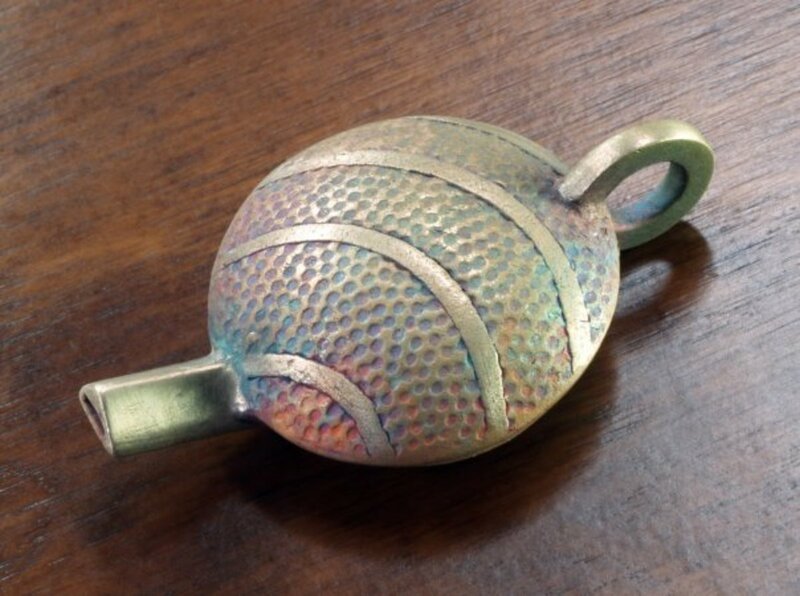 There are other ways to heat-color bronze that provide a little more control over the colors. Torching is the most common approach to heat-coloring metal. The basic idea is to warm the metal briefly with a torch and then air cool it or quench it, repeating until you see colors you like. Air cooling and quenching produce slightly different results. Some people find that quenched flame patinas are duller. Try both methods to determine which one you prefer. Deb Jemmott says she gets the best results by burnishing her fired bronze pieces and then heating them very gently on a charcoal block. She recommends heating around the metal, rather than applying the heat to it directly. Like the hot carbon in the kiln, the burning charcoal creates a reducing atmosphere around the metal. Heat the charcoal (and, indirectly, the metal) with a torch. Heat a little, then pull the torch away and watch the colors develop on the metal. Repeat the process of heating briefly, removing the torch, and watching the colors develop until you see colors you like. It is important to heat the metal gently and briefly because the colors will continue to develop on the hot metal even after you pull the flame away. Deb says "if you see the colors while the torch is on the piece, it is too hot and when you pull the torch away, the colors will be gone." Even if you torch a piece too long, it can be salvaged easily. Wire brush and burnish or tumble it until shiny and just toss it back in the kiln with your next BRONZclay load. 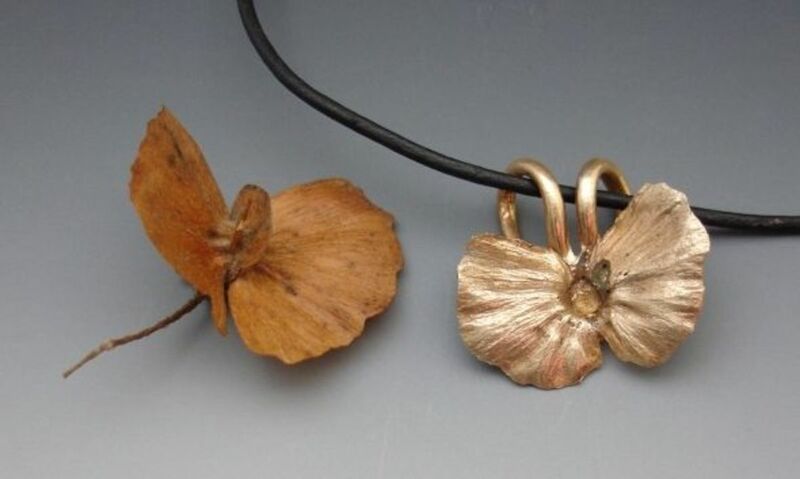 When Judi Weers accidentally kept her torch on some bronze charms for too long and they turned black from surface oxidation, she used this technique very successfully. After re-firing them with her next load, the charms came out of the kiln with a beautiful deep gold and pink patina. A torch is not the only way to color bronze with heat. Taos, New Mexico artist Susan Dilger sometimes warms her fired bronze pieces on a preheated, uncovered UltraLite beehive kiln. 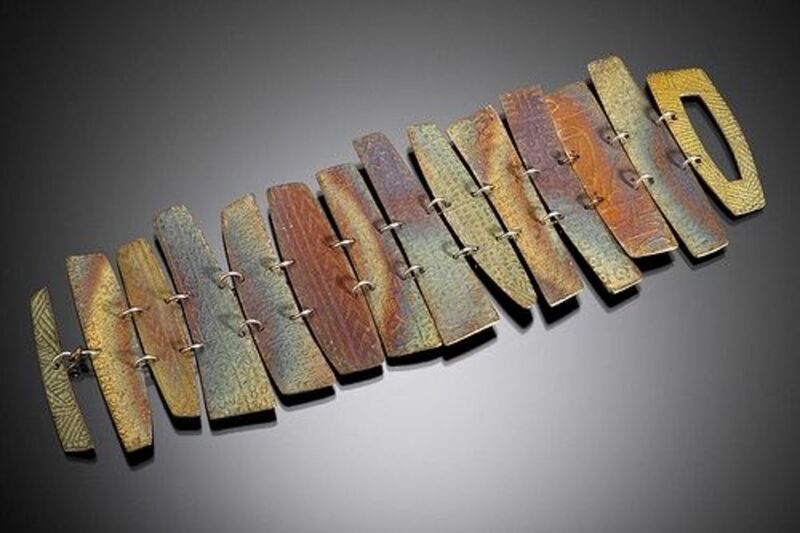 She warms only only one piece at a time, watching it very closely, and removes it from the heat the instant she begins to see a hint of colors she likes, knowing that they will continue to develop as the metal cools. As with torch coloring, pieces heat-colored on an UltraLite can be quenched to inhibit further color development. Liver of Sulfur reacts to bronze differently than it does to silver. In her book "Silver and Bronze Clay: Movement and Mechanisms", Hadar Jacobson explains that although you cannot get the range of colors on bronze that you can on silver, a Liver of Sulfur solution can be used to achieve a dark gray (almost black) patina on bronze. She recommends dipping the metal in LOS solution very briefly and then in cold water, dipping alternately in patina and water until the desired depth of color is achieved. When the color deepens to you liking, immediately rinse the piece thoroughly in cold running water to stop the reaction. Hadar warns that if bronze metal is left to sit in the solution rather than being dipped alternately in patina and water, the patina will be very difficult to remove from the areas where you do not want it. Alternatively, instead of building the color gradually, you can use a paintbrush, toothpick or cotton swab to apply patina just where you want it. It's a good idea to neutralize the patina after achieving the desired color. Swish the piece in a saturated solution of baking soda and cold water, then rinse thoroughly under cold running water. Celie Fago sometimes uses ammonia fumes to add bright blue or blue-green patinas to her bronze pieces. 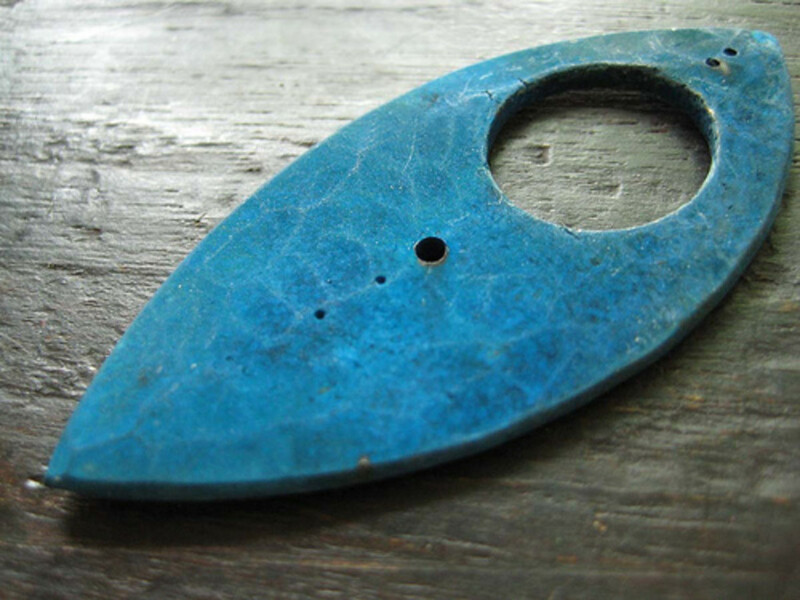 The bright blue patina in her Blue Bronze Pendant, shown below, was made by fuming the bronze piece over plain household ammonia. Celie explains, "You can add salt to the ammonia for a bit more green in the blue but here I used only household ammonia. Suspend the piece over (not touching) an inch or two of ammonia in a glass jar with a lid. Drill small holes in the jar lid to pass a wire through or work it out so the jar lid will close over both ends of the wire on which the bronze piece hangs. Leave it to fume until you like the color, anywhere from 24 hours to 10 days. It is wise to open the jar slowly, and out of doors, as the ammonia fumes build up and you won't want a big whiff of it." Caution: Breathing any type of chemical fumes can be hazardous to your health. Some chemicals are worse than others in this respect. Read the label warnings before using any chemical and always work in a ventilated area. Consider wearing a respirator when using these chemicals; read the packaging carefully and ask your supplier if the model you are buying is rated for filtering out chemical vapors.
" The Colouring, Bronzing and Patination of Metals" by Richard Hughes and Michael Rowe was first recommended to me some years ago by Celie Fago. 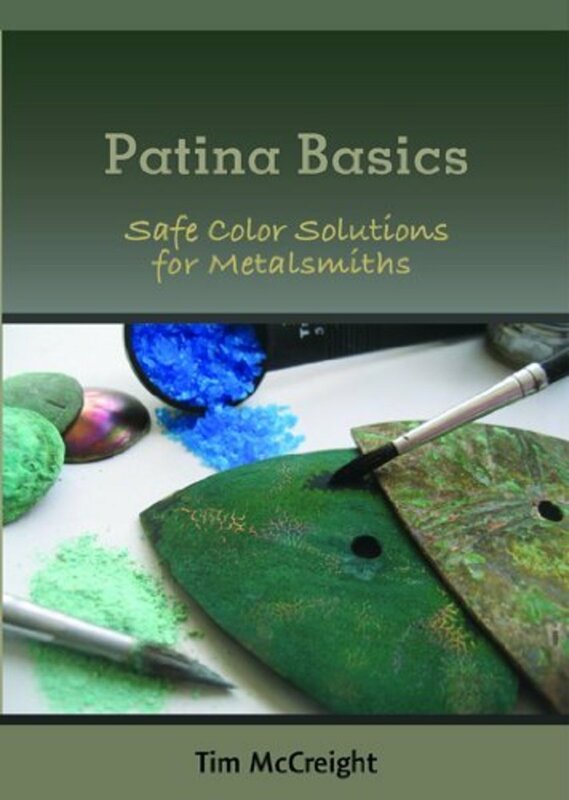 Since then I've also seen it recommended by many other top metalsmiths and jewelry artists as the best source of information on metal patinas and other techniques for coloring metal. The authors have brought together, tested and organized literally hundreds of metal patina recipes and other color treatments! There are recipes for coloring cast bronze, cast yellow brass, yellow brass sheet, copper sheet, gilding metal sheet and silver sheet, and silver-plate and copper-plate. There are hundreds of illustrations and beautiful color photos throughout the book as well as notes on each recipe that focus on potentially dangerous chemicals or processes and emphasize safety procedures. There's a good reason that this book of metal coloring and patina recipes remains in print as a must-have reference for metalsmiths worldwide even 20+ years after its original publication date. Highly recommended. Although you cannot diffusion bond fine silver or gold foil to bronze using the keum-boo method, you can add silver accents with Accent Silver, a product created by the company that brought us Accent Gold for Silver (AGS). Accent Silver comes as a metal powder that is mixed to a slip consistency as needed. The slip is painted onto clean metal and fired in coconut-based carbon in a brick, ceramic or UltraLite kiln. You can add silver accents to any clean bronze, brass or copper metal that will fit in the supplied firing container, including sheet, wire or castings. Watch Mardel Rein of Cool Tools demonstrate how to prepare Accent Silver and how to use it in a BRONZclay earrings project. Then watch Mark Nelson of Rio Grande demonstrate the use of Accent Silver on base metal stampings in a segment of the public television series on jewelry making, "Beads, Baubles and Jewels". You can set CZs, lab-created stones and some sapphires and rubies (corundum) in BRONZclay as long as they can survive the prolonged high temperatures without cracking or changing color. For information about stones that can or cannot be fired in metal clay, see my article on Setting Gemstones in Metal Clay. If you are creating settings out of the clay, make them a bit looser than you would if you were using silver clay. Also, to keep the activated carbon granules from getting between the setting and the gemstone during firing, you can use fine stainless steel mesh to cover the setting or fold the mesh into a small covered box inside which you can place your piece before covering it with the carbon. Hattie Sanderson wrote an article about her method of carbon firing clay inside a stainless steel mesh box — and how to make the boxes — that she developed while testing PMC Pro. It's easy to test-fire a loose stone in a kiln or with a torch before embedding it in a silver or gold precious metal clay design. However, searching for a loose stone amid pounds of carbon granules is impractical! So it's especially important buy stones you plan to fire in place from a reliable supplier who will guarantee certain stones and colors as being safe to fire in metal clay. Alternatively, you can make a container in which to test fire gemstones in the activated carbon. Celie Fago described in one of her blog posts how she puts diamonds in a small bronze box — the first box she made from BRONZclay — before test firing them in carbon, which makes them easy to retrieve. The good news is that some heat-sensitive stones that cannot survive open-air firing in precious metal clay can be fired successfully in this formula when buried in carbon to protect them from atmospheric oxygen. As an example, Mardel Rein found that in her tests, tanzanite-colored CZs — which normally can be heated only to 1100F or less for no longer than 10 minutes before they start to darken — survived two separate, nine-hour firings (for a total of 18 hours) at 1550F in activated carbon with no change in the color or brilliance vs. the unfired control sample. She concluded that "it's oxygen that causes the problem in heating this type of stone, not the actual heat itself." Mardel notes that "What's important, when firing a natural gemstone, is that the gem must be fairly eye-clean. That means it should not have any fractures that might cause the stone to shatter during the shrinking of the metal." Celie has fired high-quality diamonds successfully in BRONZclay. I highly recommend downloading Mardel Rein's excellent chart of safe-to-fire gemstones in metal clay which is based on her own extensive testing of torch-firing, kiln-firing, and kiln-firing in activated carbon. You'll find it on the Cool Tools site. Set faceted stones so that the table (top surface) is below the surface of the clay. Lora Hart recommends cleaning gem setting burs frequently while making deep holes for faceted stones, since the burs clog easily when used on bronze greenware. For cabochons, press the stone into the clay until less than half the height of the stone remains exposed above the clay. Smaller bezels will shrink more (proportionately) than larger ones. If you wish to set natural gemstones or other stones that cannot survive the clay's firing conditions, you may be able to embed fine silver bezel cups successfully. BRONZclay pieces must pieces be thick enough to support themselves, but not so thick that they collapse under their own weight. Like high-shrinkage Original/Standard PMC, BRONZclay is affected by gravitational pull more than medium- and low-fire silver clays. For this reason, hollow forms should be made thicker than equivalent pieces in silver clay. For example, Celie Fago recommends rolling the clay for small lentil beads (less than 1-1/4" in diameter) at 4 to 5 cards thick, and rolling larger lentils at 6 to 7 cards. Mardel Rein suggests that a 3/4"–1" domed disc be rolled at a minimum 4 card thickness, a 1-1/4" to 1-1/2" domed disc at least 5 cards thick, and a 2" domed disc at least 6 cards thick. Remember to orient hollow forms in the carbon in a way that minimizes the likelihood of distortion or sagging during the firing process (e.g., position lentil beads vertically in the activated carbon granules; place domed discs horizontally with the opening face up in the carbon, like a bowl). Armatures are dimensional structures used to help form and support fresh clay until it has dried. Combustible cores are armatures that are enclosed within the clay during firing that burn out partially or completely during firing. Non-combustible cores are enclosed permanently inside the outer metal form. It's fine to use temporary armatures while shaping and drying bronze clay. You can create enclosed hollow forms by making them in two or more pieces and then attaching them when all pieces are dry, or by using a hollow construction technique developed by J. Fred Woell which involves draping rolled-out clay loosely over a freeform wire armature, lifting the clay off the armature when dry, sanding the open edges in a flat plane, and then attaching it to a sheet of freshly rolled-out clay to close the form. Fred wrote an entire chapter explaining this technique in the awesome book, PMC Technic: A Collection of Techniques for Precious Metal Clay. Combustible materials burn only in the presence of oxygen, so they do not burn out much during a carbon firing. Only very thin combustible cores (e.g., leaves, cheese-flavored snack puffs, puffed breakfast cereals) seem to work successfully in carbon firings without an open-air burn out phase. The newer, two phase firing schedules make it possible to use other combustible cores successfully, including wood clay and cork clay, because the cores can burn out during the open-air firing phase. Celie Fago uses Kix cereal or cheese-flavored snack puffs coated with Sobo glue as combustible cores for small beads in both BRONZclay and PMC. Sometimes she wads together several glue-coated Kix or cheese puffs to form larger combustible cores in various shapes. She covers the glue-coated cores either with multiple layers of very thick metal clay paste or with rolled-out lump clay to form hollow-core beads. If you are using an open-air firing schedule, small pieces of fiber blanket can support shapes during the open-air phase but should be removed before the carbon firing. In general, non-combustible size/shape placeholders are not recommended for use with any high-shrinkage clay. The clay will crack or break when fired around investment, plaster or Creative Paperclay plugs, such as ring sizing pellets, flat placeholders (e.g., for cabochons) or modeled cones of faceted stones or other items to be set after firing. The safest way to combine bronze and silver clay in the same design is to fire the components separately and then join them with solder or cold connections. Many types of cold connections are possible and can add interest to your designs. Rivets, tabs and jump rings are common choices. 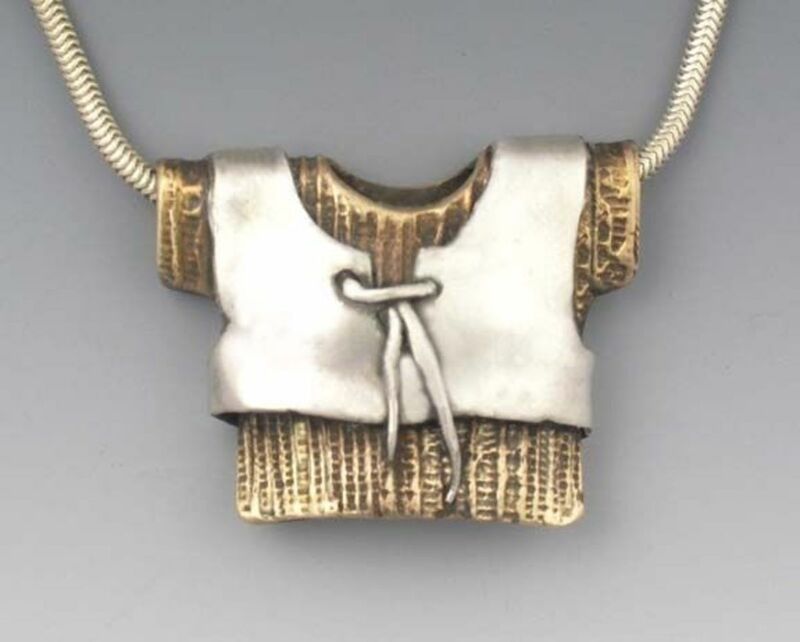 One of the most innovative approaches to cold-connecting bronze and silver clay components was developed by Jen Kahn of Jennifer Kahn Jewelry for her "Modern Relics" design series. Jen, who wrote a terrific chapter about her bezel setting techniques in the wonderful book PMC Technic: A Collection of Techniques for Precious Metal Clay, makes and fires bronze clay components designed to be bezel-set in fired PMC pieces. For her "Bronze Knuckles" ring she created a bronze clay cabochon that she set in a fired silver clay bezel. Any time you fire bronze clay with silver, you introduce an element of risk. If you have a high risk tolerance, you may want to try some of the following methods for firing bronze clay with already fired silver clay. Hadar Jacobson's book, "Silver and Bronze Clay: Movement and Mechanisms," covers this topic in great detail. In my opinion, this is a must-have book for anyone who wants to work with bronze clay. Hadar has done extensive testing of the results of firing pieces containing both bronze and silver clays. While this article will not attempt to cover this topic in detail (for that, you need to buy the book, I have highlighted some of her key findings here. Unfired bronze and silver clays cannot be fired together successfully. One (preferably the silver clay*) must be fired first. The reason is that the two metals will try to alloy during firing. Trust me, the results are NOT pretty! Bronze clay can be fired successfully over silver metal (including previously fired silver metal clay), but only if the bronze clay covers more than 50% of the silver metal surface. 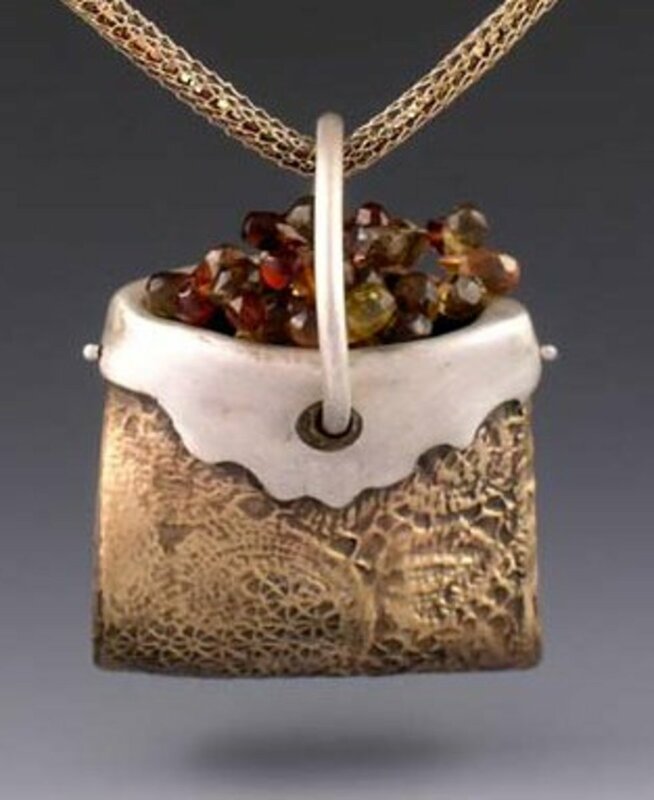 While adding fresh bronze clay to fired silver clay is preferable*, it also is possible to torch-fire smaller proportions of silver clay over previously kiln fired bronze clay, as in Hadar's beautiful Bag pendant with garnet beads, shown below. In this situation, always fire the silver clay addition with a torch; do not put the piece back in the kiln. *The presence of bronze clay (fired or unfired) and the reduced-oxygen firing environment required for sintering the clay inhibit fine silver clay from sintering completely. Therefore, whenever possible, the fine silver clay components should be fired first, using silver clay firing methods and firing schedules, to ensure full sintering of the silver. The second firing, after the bronze clay is added, should be done using bronze clay firing methods and firing schedules. If silver clay is fired over bronze clay, torch-fire the silver components (do not kiln-fire them). Make the bronze clay component and cut a hole for the tube rivet. Dry, fire and cool the component. Cover the entire surface of the bronze metal, including the inside of the rivet hole, with Creative Paperclay thinned with a little water. Hold it with cross-lock tweezers as you apply the paste. Dry it on a mug warmer. Continue to add and dry additional paste until none of the bronze metal is showing. Remove the tweezers and fill in the bald spots with additional Creative Paperclay paste to hide the bronze metal completely. Create the main silver component (no hole), a tube that will just fit inside the hole in the bronze metal component, and a flat disc considerably wider than the diameter of the tube using silver metal clay. Dry these to the leather-hard stage. Attach one end of the tube to the main unfired silver clay component with thick silver clay slip (paste). When it dries, slide the Creative Paperclay coated bronze metal component onto the tube and make a pencil mark on the tube where it exits the hole in the bronze component. Make another mark slightly beyond the first one and file/sand off the excess length of the tube. Reinsert the tube through the hole in the bronze component, then use thick silver clay paste to attach the disc, centering it over the tube. Let the silver paste dry. Wash the bronze component in water to remove the Creative Paperclay paste residue. For an explanation of this technique with pictures, see the "Riveted Earrings with Silver and Bronze II" project in Hadar's book, "Silver and Bronze Clay: Movement and Mechanisms". According to Hadar, fresh bronze clay components may be co-fired with previously fired silver clay components successfully as long as 1) the pieces are prevented from being in contact during firing and 2) there are "not too many" silver pieces in the firing container. 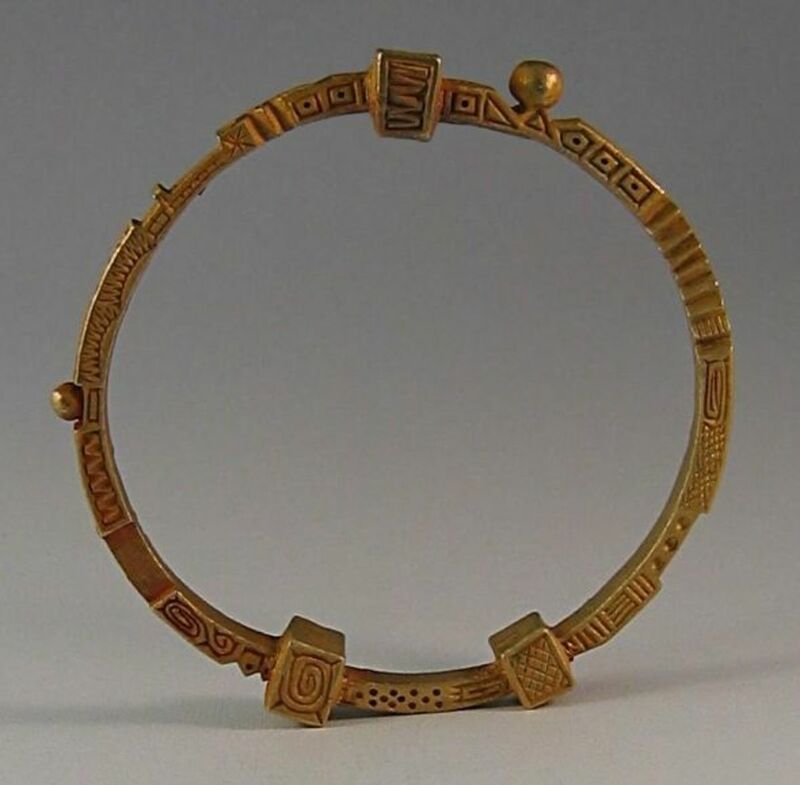 For example, if you wanted to make a bracelet of bronze clay and PMC, you would make and fire the PMC links first, and then connect the metal links with leather-hard bronze clay links. Arrange them in the carbon alternating the orientation of the links as usual, i.e., one link is placed on edge in a vertical orientation, the next link is placed flat in a horizontal orientation, the third is placed vertically, etc. Keep the chain relaxed and make sure that carbon granules are separating the links completely to prevent any contact during firing. Another way to prevent contact in the kiln between bronze clay and previously fired silver clay (or, if necessary, between silver clay and previously fired bronze clay*) is to separate them with pieces of Thin-Fire or similar thin fiber paper or with a thin layer of rolled out Creative Paperclay, which is made from volcanic ash and can be removed easily after firing. By separating the metal clay from the metal with fiber paper or Creative Paperclay, you can create moving parts, such as "spinners" that will spin freely around other parts after firing. Both Hadar and Celie Fago have made spinner rings consisting of a thinner bronze clay band or bands that spin(s) freely inside a channel in a wider, previously-fired silver clay band. Two-tone spinner beads are another popular use for this technique. Hadar cautions against firing narrow layers or strips of silver clay over fired bronze clay, or narrow strips of bronze clay over fired silver clay because the newly added clay may not sinter fully. She also warns that re-firing pieces that contain both fired silver and fired bronze clay will not work if the bronze and silver metals are in direct contact and that doing so "may cause irreversible damage to the piece." Many thanks to Hadar for generously sharing the findings from her extensive experiments on firing bronze clay with other metals and metal clay. Even with all the experimentation and learning that have taken place so far, firing pieces that include some combination of fired and unfired bronze and silver clay components together remains a somewhat iffy proposition that should be approached with caution. Celie Fago recommends that firing bronze clay with already-fired silver clay should be attempted only "in the spirit of experimentation," with the clear understanding that complete sintering of both metals is not guaranteed and that there is a risk that the bronze and silver may alloy, resulting in anything from ugliness to disaster. She advises against firing silver clay with already-fired bronze entirely. Many artists have embedded copper or bronze wire, findings and settings in bronze clay and fired them in place successfully. Be sure to use either true bronze or high-grade pure (99.9%) copper for embedding in bronze clay. Lesser grades of metal will degrade and become brittle after firing. The Embeddables line of cast metal bails, eyelets and prong settings is designed specifically to be embedded in metal clay and is available in bronze and copper (as well silver). In a post on Hadar Jacobson's blog, she said that in her experience, bare copper wire embedded in base metal clay will break when bent after firing, but bronze wire can be embedded and fired successfully. 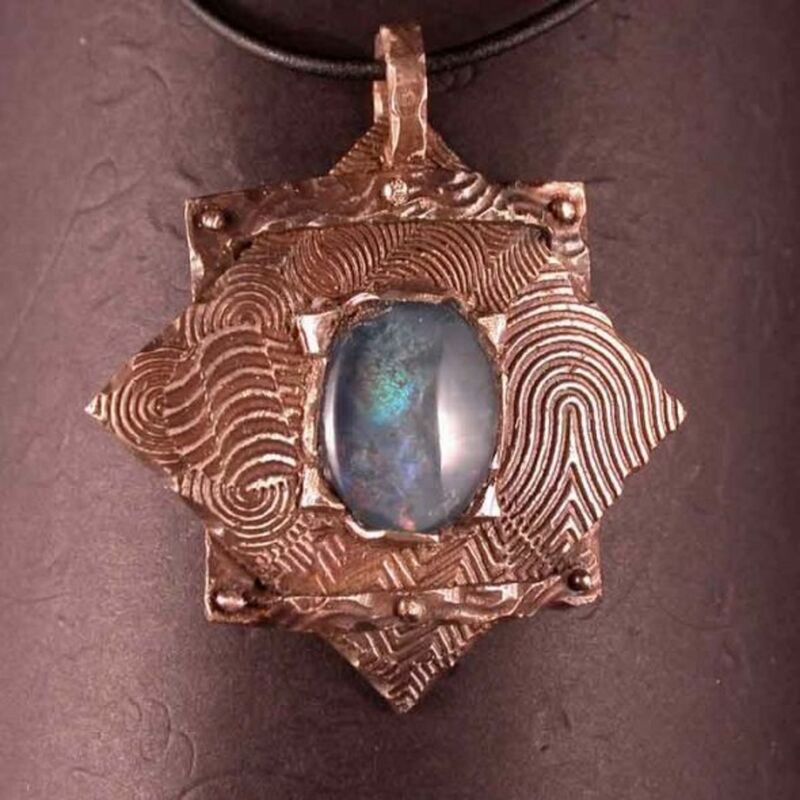 According to Pam East, copper wire can be embedded and fired successfully in copper clay as long as you "use 99.9% pure copper wire from a trusted jewelry source," which she said is available from Rio Grande and Metal Clay Supply. "The stuff you get at the hardware stores or other inexpensive sources is probably not pure copper and that's why it breaks after firing." She also recommends using a higher-gauge wire if you are doing an open-shelf firing, since some of the copper will be removed when you abrade away the fire scale. The same should hold true for copper wire that is embedded in bronze (rather than copper) clay. It's important to keep in mind that not all bronze wire is true bronze metal. Some wire that is sold as bronze may be bronze colored brass (an alloy of copper and zinc) rather than true bronze (an alloy of copper and tin.) Brass wire that has been treated to look like bronze may not retain its bronze color over time or if heated. And, of course, it's important to know what materials are in your pieces so you can mark them accurately, among other reasons. So ask your wire suppliers about the alloy from which their "bronze" wire is made so you know what you're using. In general, it is considered inadvisable and very risky to embed fine or sterling silver wire, findings or settings in bronze clay except under very specific circumstances because the metals will attempt to alloy with each other, with ugly (and often worse) results. In her book "Silver and Bronze Clay: Movement and Mechanisms," she says fine silver bezel cups may be embedded as long as the proportion of fine silver to bronze clay is small. (In other words, don't embed a fine silver bezel cup into a piece of clay that isn't significantly larger in diameter than the silver cup). Also, the bronze clay must be thick enough for the bezel cup to be embedded fairly deeply, since it shrinks more than silver clay. In her book Hadar recommends using the inverted bezel cup to cut a perfectly-sized hole for embedding the bezel. She says that the bezel may be soldered in place if necessary (i.e., if it pops out of the hold after firing). Since it's impossible to be certain how well a particular type of wire will survive firing, Celie Fago recommends test firing a piece of the wire you plan to use before embedding it into your work. Add the test wire to a BRONZclay kiln load, then check to see whether the color remained stable and bend the wire to see test for brittleness. Mardel Rein points out that you also can anneal bronze wire that seems brittle and see whether that makes a difference. 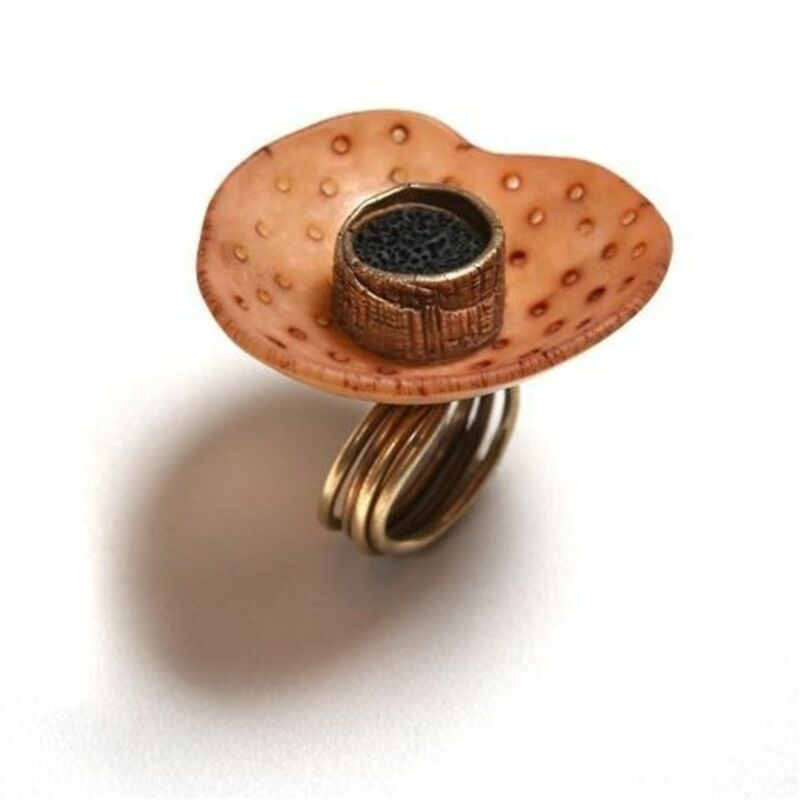 Alternatively, you can design your piece to give the appearance of embedded wires in bronze clay, as Ronna Sarvas Weltman did for her unusual bronze, polymer clay and bronze wire ring shown below. Ronna shaped and fired the circular bronze clay frame and then made a wide polymer clay shaped disk with a small hole in the center. She made a triple ring shank from bronze wire, leaving one end of the wire sticking up from the band. Then she threaded on the disk and bent the end of the wire to secure the disk. The frame was centered over the wire and filled with black polymer clay. BRONZclay lends itself beautifully to making hinges. The most obvious reason is that after the clay is fired, the bronze metal is extremely strong and durable. Another is that the tubes shrink very little in their interior diameter after firing, so it's easier to estimate the gauge of the wire that will be needed for the hinge pin. The most important thing to remember when making hinges from this clay is to ensure that the hinge tubes are attached extremely securely. Fresh clay straight from the package and conditioned will provide the most strength for both the hinge tubes and the attachments. After the attachment areas have dried, reinforce them well with additional clay. 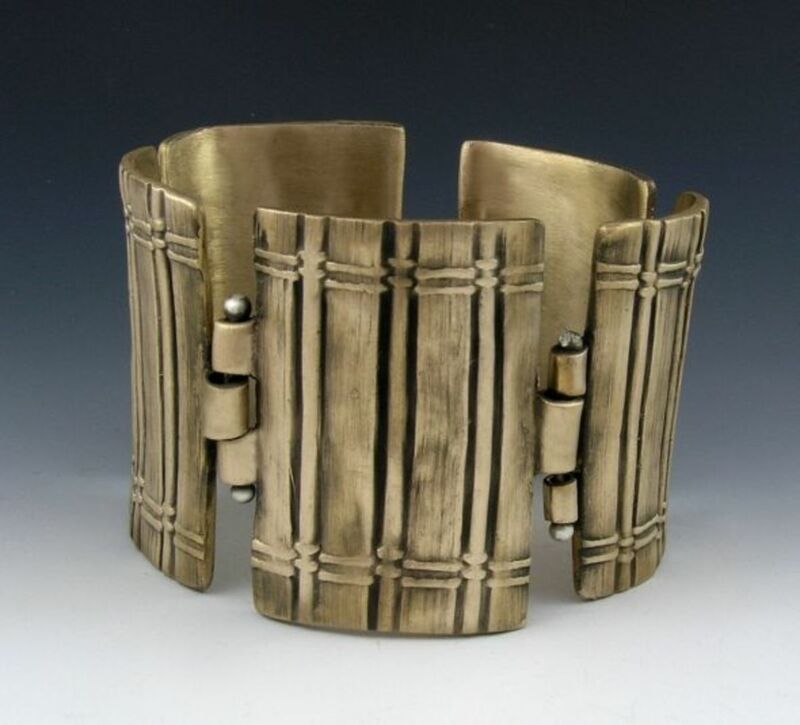 A good way to practice making hinges from this formula is to make the Hinged Bronze Fence Bracelet project (shown below) from Hadar Jacobson's book, "Silver and Bronze Clay: Movement and Mechanisms". For some people, prolonged skin contact with bronze can result in discoloration or allergic reactions to the large proportion of copper in the metal. So it is a good idea to use sterling, fine silver, fine gold, stainless steel or another non-reactive metal for earring posts and earwires whenever possible, unless you know the wearer does not react badly to contact with bronze or copper. 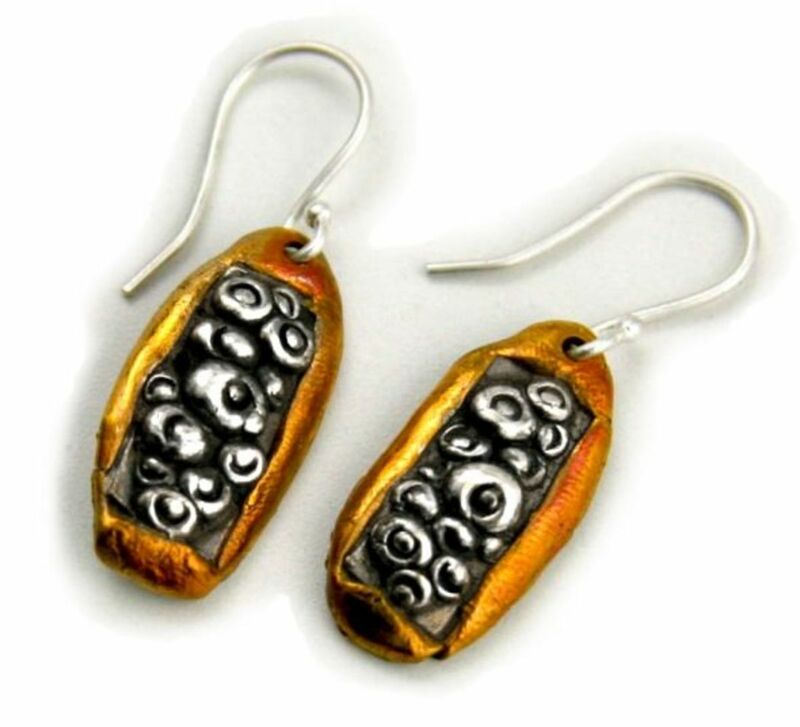 You can make dangle earrings or solder on earring posts made from a suitable metal after firing. 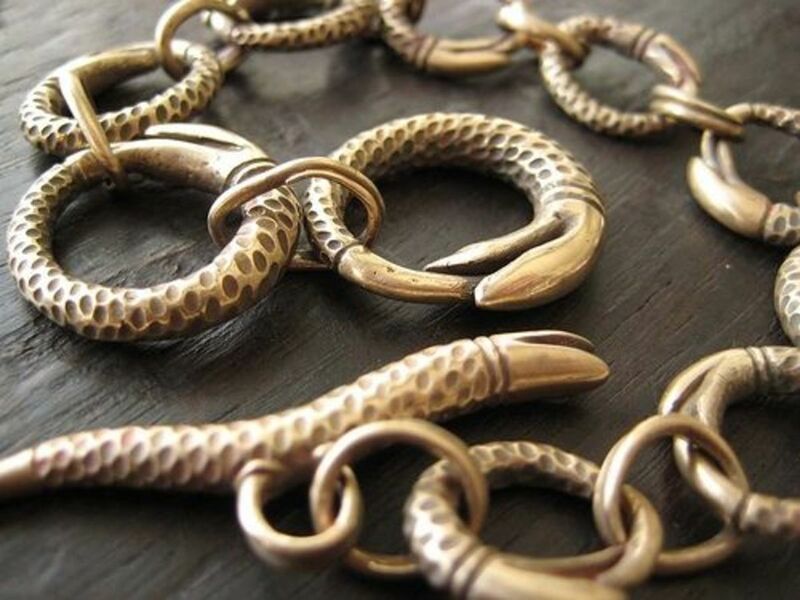 Mardel Rein suggests lining bronze bracelets with snakeskin, leather or Ultrasuede fabric, and recommends using fine silver, sterling silver or gold ring inserts (or silver plating bronze rings) to create a barrier between the bronze and the wearer's skin. You can build bronze clay rings over the excellent fine silver ring liners made by Metal Clay Findings, which have cross-hatched surfaces designed to help metal clay adhere to the silver metal liner. Cover the top and the sides of the liner with bronze clay before firing to ensure that it constitutes more than 50% of the ring, or paint the exposed silver metal with Creative Paperclay thinned with water. You can design silver clay rings or bracelets with trenches for bronze clay spinners. 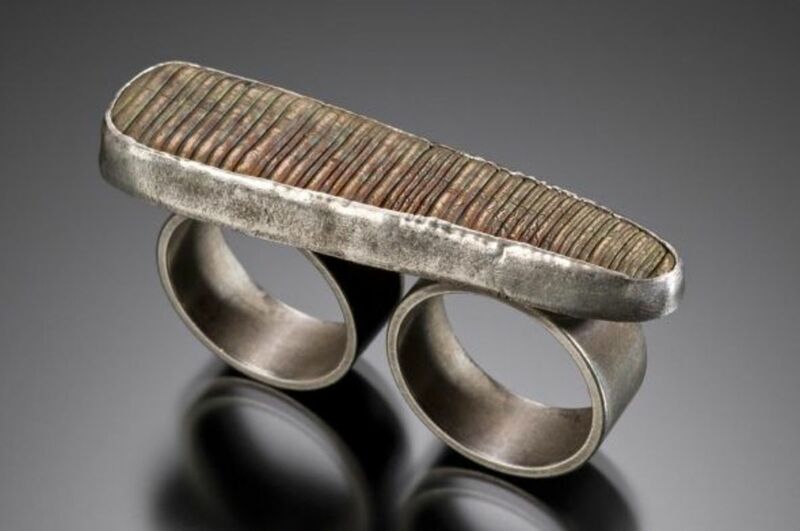 Celie Fago often makes bronze rings a little larger than the desired finished size and then lines them with a thin layer of black polymer clay to protect the wearer's skin. The same approach can be used with a close-fitting cuff bracelet. Unless you want to glue the polymer clay liner inside the metal, make the edges of your bronze ring or bracelet slightly convex or concave so the polymer clay will be held in place with a tension fit. 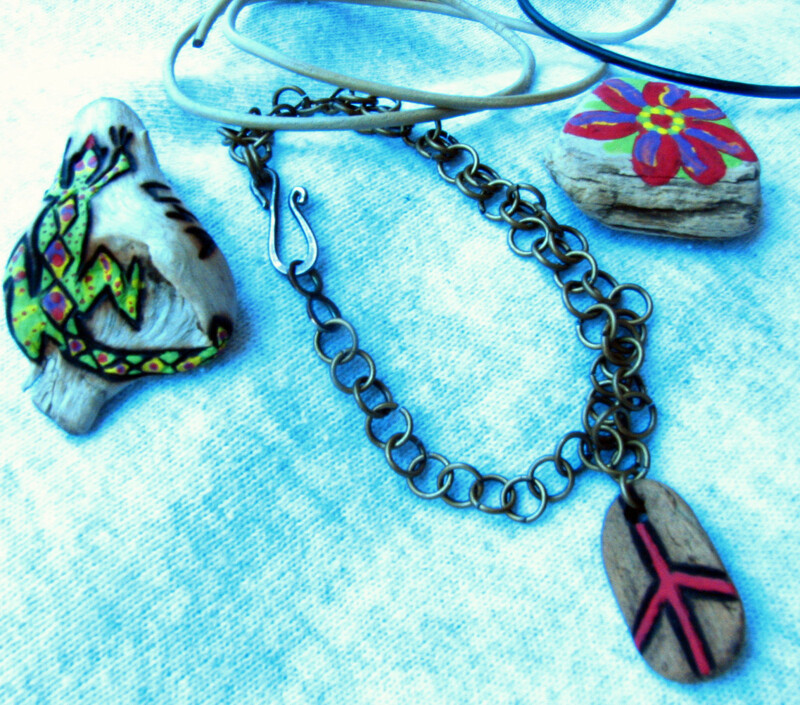 Alternatively, the polymer clay liner can be made more visible and used as a design element, as in the left-hand ring in her trio of primitive bronze rings shown above. Carving into the interior and inner edges of the band creates some "tooth" for the polymer clay to grab onto. Note: The polymer clay liners must be added AFTER the jewelry has been fired and then cured in an oven or toaster oven (preferably one dedicated to polymer clay) as directed on the package. 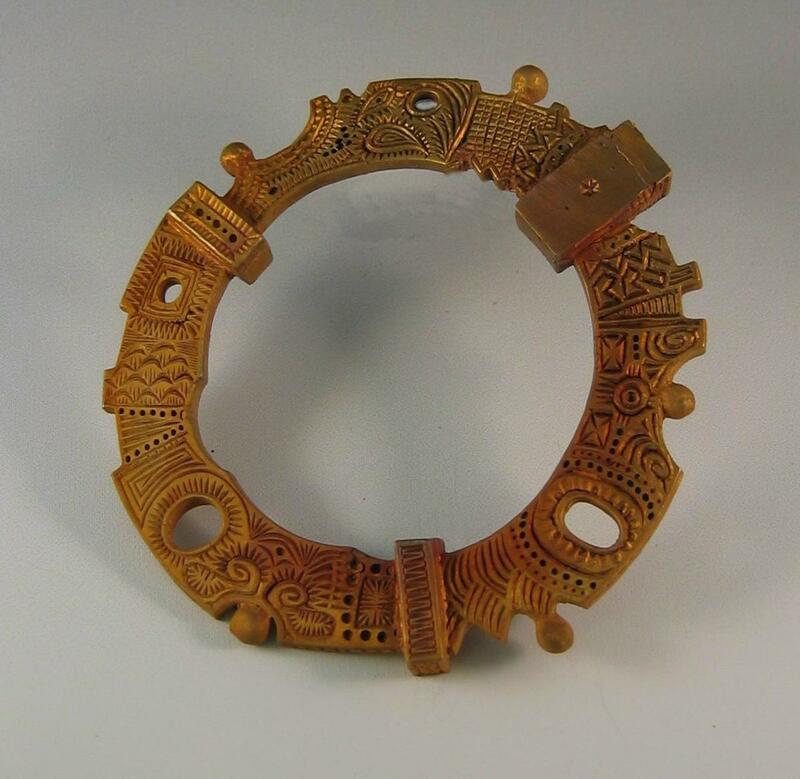 Another approach is to coat the insides of bronze metal rings or bracelets with lacquer. However, it is important to understand that, because lacquer is a surface coating, it is likely to wear away eventually and, in some cases, chip. If the lacquer does chip it should be removed completely and a fresh coating should be applied. Look for a coating that is resistant to chipping. Nikolas spray lacquer is one of the best and most durable metal lacquers on the market. Tonya Davidson says she has never experienced any chipping or peeling with it. Artist Sue McNenly, who tested the product extensively for her, gave it rave reviews, and for many other artists it is the coating of choice for fired silver metal clay. It has not yet been tested extensively on fired bronze clay. Midas finish seal lacquer (item # 335-123 from Rio Grande) is another option. It is applied with a brush rather than sprayed. Holly Gage, who has used it the Midas lacquer on silver for about a year, says that it is thin and self-leveling so that it leaves no brush marks, and that she has not experienced any flaking or chipping so far. She has not tried it on bronze or copper metal clay pieces yet. Erica Roberts and Joyce Laverty have recommended ProtectaClear, a clear, flexible coating that, unlike lacquers, is designed to be flexible to avoid chipping, cracking or peeling. According to the manufacturer, it does not yellow or discolor with age and can be reapplied without first removing the existing coating. 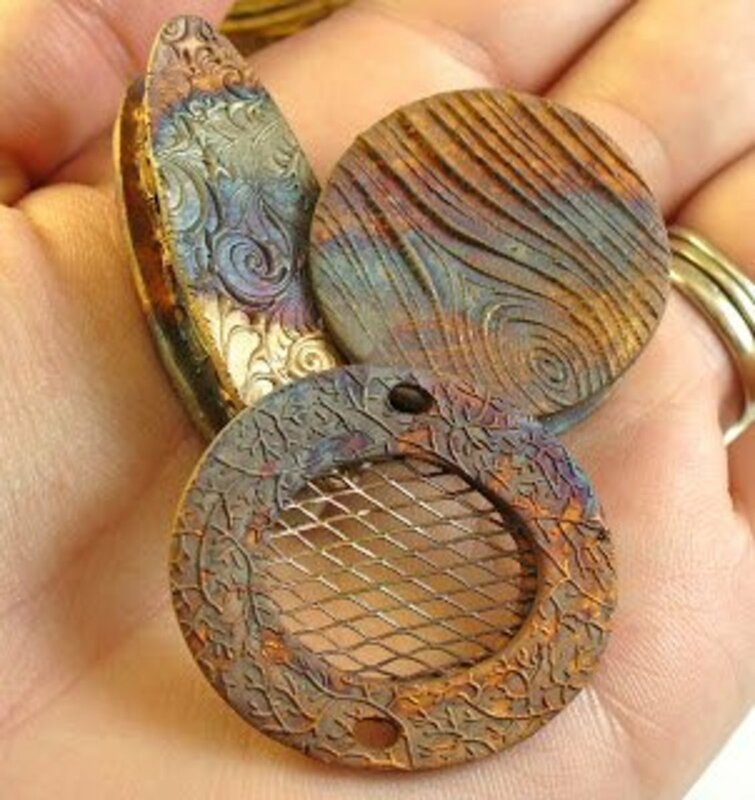 Linda Gaughran suggests trying Pébéo Vitrail 160 glass paints, which she uses on the backs of bronze pendants. 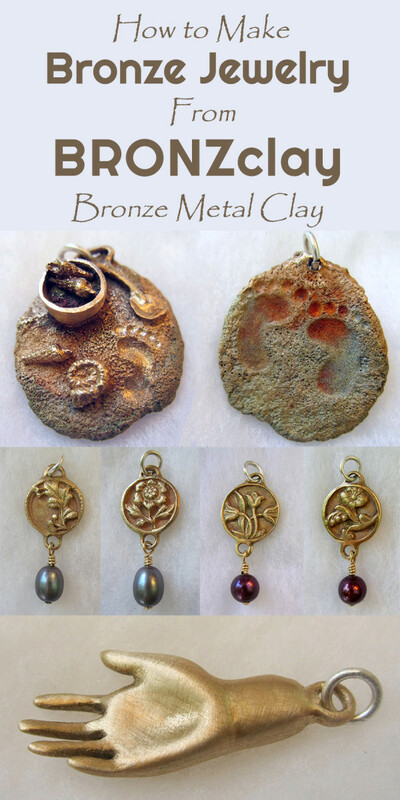 Elaine Luther, jewelry artist and author of the excellent blog All Things Metal Clay, set up a Bronze Clay Pool group on Flickr where metal clay artists can posts photos of their bronze clay pieces. I encourage you to click on the link to view many wonderful bronze clay designs by talented metal clay artists, and to share your own work in bronze clay. Different artists use slightly different approaches to working with this bronze clay formula. Here are some video tutorials I think you'll find helpful. This article represents the collective expertise, experience, and creative explorations of dozens of bronze clay artists, inventors and other experts. I am incredibly grateful for their generous contributions to this article and to the metal clay community's growing body of knowledge about working with bronze clay. Thanks to everyone who. directly or indirectly, generously shared their experiments (both successes and failures), their favorite techniques and tips, and photos of their inspirational work in bronze clay. Special thanks to the reviewers, including (in alphabetical order) Tonya Davidson, Celie Fago, Marco Fleseri, Lora Hart, Hadar Jacobson, Gail Lannum, Mardel Rein, Bill Struve, LaceyAnn Struve, Gordon Uyehara and Kevin Whitmore, who graciously invested many hours reviewing some or all of this vast body of content and providing their valuable feedback and insights. 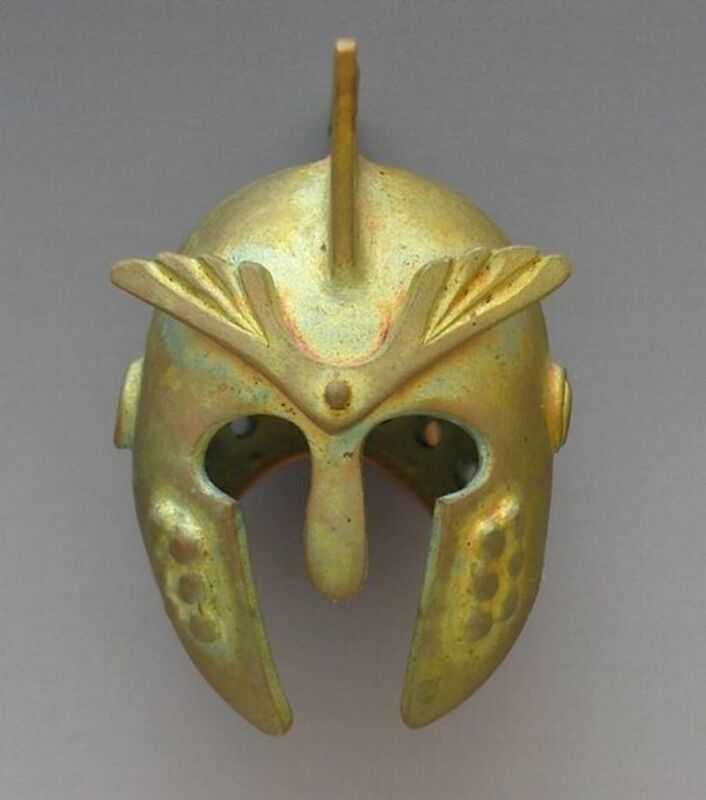 I want to refire a bronze piece in the shape of a mask (hollow, like half of a ping pong ball). Do I need to worry about the placement of the fired mask in the kiln and that the piece might slump, even though it is already fired and sintered well? If your piece has already sintered, it shouldn't slump if it is fired again. I suggest refiring it face up, so the hollow back is supported by the activated carbon. How do I preserve a kiln patina? Should it be sealed in some way to ensure it stays? I’ve found that they last for a long time on sintered bronze clay. However, unfortunately, there’s no way to preserve them indefinitely without altering the appearance. You can try applying Nikolas 2105 spray lacquer or brush on a thin layer of Protectaclear, but both will add a shiny finish that will affect the way the colors appear. You might try applying one of these coatings to a test strip to see the difference with and without. Have You Ever Worked With BRONZclay or Another Bronze Metal Clay Formula? Did You Learn Something New Here? Thanks very much, Kim. I’m very glad you found my article valuable! I haven’t tried soldering fired BRONZclay or other forms of bronze metal. I recommend posting your question in the Facebook group Metal Clay Now. It is the largest online metal clay community, so someone there may have tried soldering sintered BRONZclay. Fantastic article, thanks for sharing. I am looking for information on soldering fiired Bronze clays together to form a larger piece of work, do you have any knowledge of soldering and successes? Holly Anne Black, glad you found this article helpful. Please keep in mind that it refers specifically to the regular (not Fast Fire) formula of Metal Adventures BRONZclay. The firing schedule for Prometheus White Bronze will be different; I suggest you follow the manufacturer’s instructions on the package. Good luck and have fun! Thanks for all the good information. I. May have been ramping too fast and not holding long enough. New package of Prometheus White Bronze clay with plenty of time to experiment and play. If you believe the problem was due to over-firing, I would suggest you experiment with your firing schedules before deciding that the clay's age is a contributing factor. Better yet, you might want to purchase a new package of BRONZclay to use for determining the optimal firing schedule for your individual kiln/carbon/firing pan combination. Once you have determined a firing schedule that sinters your pieces correctly when using new, fresh clay, you can try test-firing samples of the older clay to see whether they sinter properly using that schedule. Hope that helps! I recently opened a new package of BRONZEClay which had been in storage for several years. (Circumstances in my life had required that I put aside my jewelry-making activities for a period of time.) Instead of having a nice Terra-cotta brown color, the clay looked dark brown. As I manipulated the clay in my hands and conditioned it, a black residue came off on my hands. Since I could not find any reference to this problem on the internet, I went ahead and formed and fired my pieces. They did not turn out no doubt d/t over firing. Should I continue to experiment with firing schedules using this clay, or is the clay no good? @a9rSQn3c: Hi, I haven't done any soldering on bronze, but my understanding is that you can use silver solder on it. Rio Grande also sells solder for base metals that you could try. Since BRONZclay is fired in activated carbon, there should be very little oxidation on pieces fresh from the kiln. Just brass brushing them as usual ought to remove the oxidation. I assume you would apply a fire coat solution as usual (I hear Firescoff is good and it's premixed) and soldering flux (or paste solder with flux mixed in) in order to prevent more oxides from forming during the soldering operation. One thing to be aware of is that it's best to avoid pickling, if possible, since my understanding is that the pickle depletes some of the tin from the surface, leaving it more coppery than bronze in appearance. You can just boil the piece in plain water after soldering to remove the flux and fire coat. I hope that helps! Love it but I would like to know more about soldering BRONZclay. What type of solder do you use? Do you need to add white out fluid or something else to prevent oxidation? @mariebauer: Thanks very much, Marie! I'm so glad you found this helpful. wow..very nice flow of information! I love how detailed everything was. I also like the photos! Keep it up! @ecogranny: Thank you SO much for that awesome comment, Grace!!! You really made my day. Hugs! Fantastic compilation of information, told in an interesting, cohesive manner. I can imagine weeks of work. Lovely photographs as well. I had never heard of this medium. Most informative. @mattcut: Thanks so much, Matt! What a wonderful compliment! Talk about an exquisite lens ! You are fantastic ! Content = gorgeous, writing = otherworldly ! Blessings to you, always ! Fantastics lens. I feel as if I've really learnt something through reading your lens. Thank you! @anonymous: Oh, Susie, your wonderfully kind and supportive comments always make me feel wonderful! Thank you so much for being such a super lady. Hugs! Your natural teaching gifting just draws one along and you leave no stone unturned in supplying all the possible information that anyone could want. Your examples are beautiful and I especially enjoyed the shrinkage factor for some reason, something very important to consider. Beyond excellent once again and I am in awe! @vicki-jacobaas: Great! I'm delighted that you found this information so hepful. Thanks very much for letting me know! It answered my question (can i fire with stones) and found so much more! @Deadicated LM: Thanks so much for your wonderful comment! I'm honored and grateful that you enjoyed this lens enough to want to share it. Hugs! Wow, this is such an awesome and informative lens; I always wanted to play around with metal clays but I'm trying not to deviate from my fiberarts (it's not easy); besides I can't afford another hobby but I love this stuff and will share your Lens for sure. @designsbyharriet: Hi Harriet, thanks so much for the lovely feedback. FASTfire BRONZclay is a bit different than the regular/original BRONZclay formula. It doesn't carve quite as well as regular BRONZclay but it has several important advantages. The firing time is much shorter and the kiln can be ramped at full speed. The clay is MUCH less sticky than the original formula and requires only a little conditioning (Cool Tools' Slik balm is good for this vs. olive oil), and it joins to itself much more readily than the original formula (much more like silver clay joints). The finished color after firing is a bit more golden, which can be very nice, and the sintered clay (metal) is easier to file and drill than sintered BRONZclay (original formula). The FASTfire BRONZclay formula also shrinks only 10%, so it's less prone to cracking. These days I use it far more often than I use regular BRONZclay. Eventually I'll be adding information about the FASTfire BRONZclay formula to this or another lens, but in the meantime, you can get information about working with it at http://www.bronzclay.com/fastfire_bronzclay.htm. Hope this information is helpful! This is great. I was given a couple of packages of bronze clay and have not used it because I don't understand how to. Mine says it is fast fire. I this the same as what you are describing here or should I be working it differently? Nice lens! SO much detail! MANY thanks to SquidAngel RickBasset for blessing this lens on 3/13/12! Many thanks for this much welcome information. I am just beginning to experiment with this material and feel much better prepared after reading you lens. @Gayle Dowell: I am so touched by your wonderful words, and so honored to have been able to help and to have been chosen to receive your first blessing bestowed as a Squid Angel! Thank you so much for this amazing gift, and may you be blessed as well! I've used much of your info. when I first started using bronzclay. I had to come back to bless your lens. Your lens has received my first blessing first since becoming a squid angel. Be blessed as I have been. @eganj1: Thank you for the terrific feedback and have fun creating with bronze clay! @pyngthyngs: I'm delighted to have introduced you to BRONZclay! It is, indeed, an amazing material to work with. This is my first time hearing about BronzClay. What an amazing medium to work with. The jewelry that have included in your lens as an example of what can be done with Bronzeclay is gorgeous. Can you use BronzClay on a rotating pottery table? Are there any health concerns in making pottery for daily use? @westwindcreations: You're very welcome. I'm glad this lens has been helpful. Firing BRONZclay without a programmable kiln will be tricky, as the base metal clays are much more sensitive to firing temperatures than fine silver clays. I wish you luck with your test firings and look forward to hearing how they turn out! This is great. Thanks for having all this info in one place. I am doing a test fire right now as I speak to you. I may have ramped it too fast. I do not have a programmable kiln making it very tough and I have to stay and watch it turning it up and down. This may be a project that will be on hold but I will let you know how it turns out. @observemang: Thanks for the great feedback! I'm delighted that you are finding this information to be so helpful. Really a great collection of BRONZclay. Any way I wish to reuse this lens for information I have bookmarked this one. [in reply to Sroh] Thanks very much, Sam! I'm really glad you're finding it helpful. My intent is to add and/or revise the content on an ongoing basis as more artists and instructors discover and share their techniques. I love the informaiton you are providing, it is very informative and can't wait to try some of the tichniques that have been mentioned. Great collaboration with other artist and encourage them to keep sharing. This product provides all of us an opporutnity to explore something new and the more we share the more we learn and share. Keep up the great work.